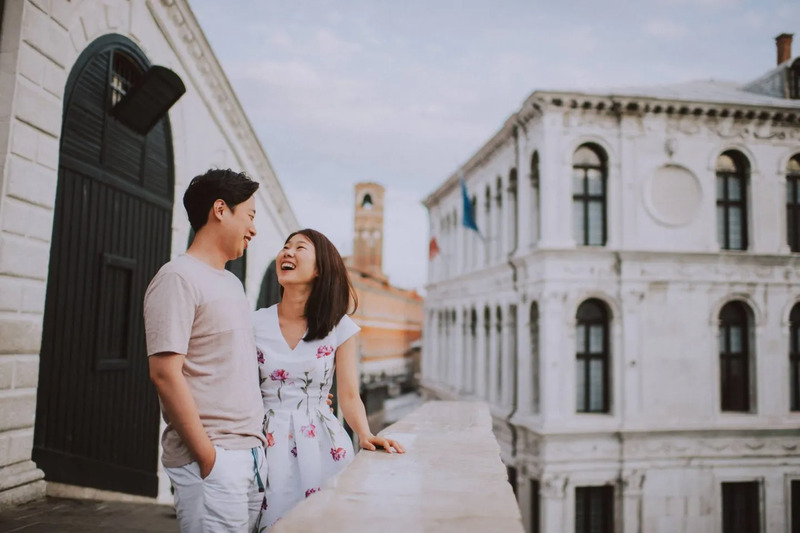 In the first place, planning your engagement, prewedding, wedding or honeymoon photoshoot from abroad, it might be a tough task. 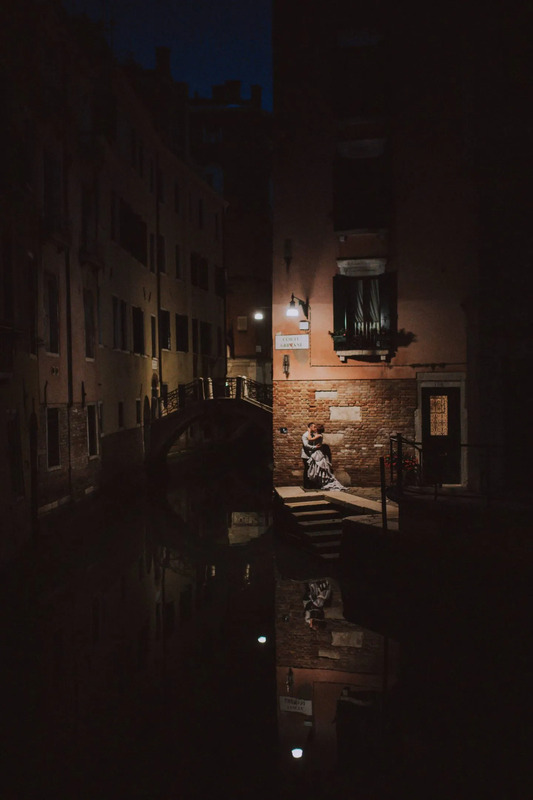 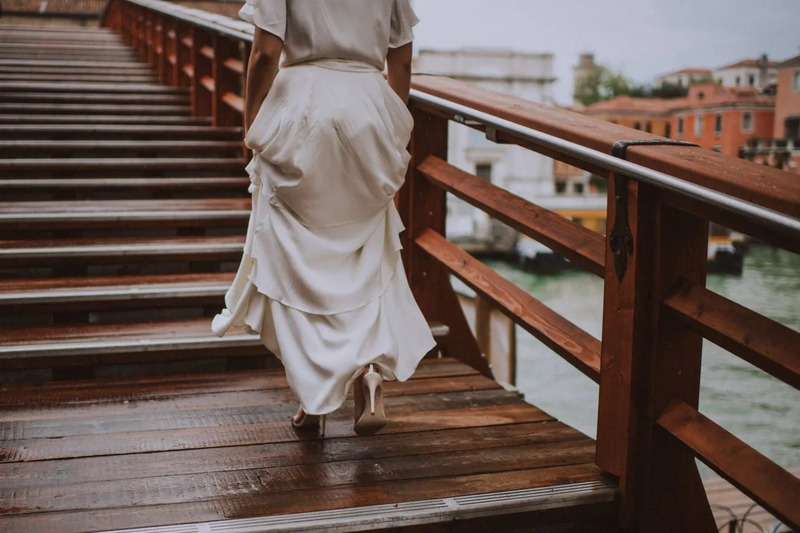 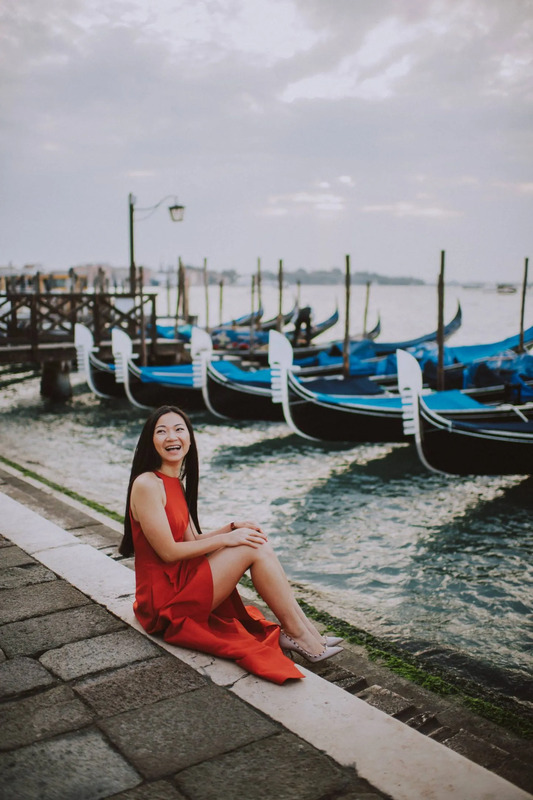 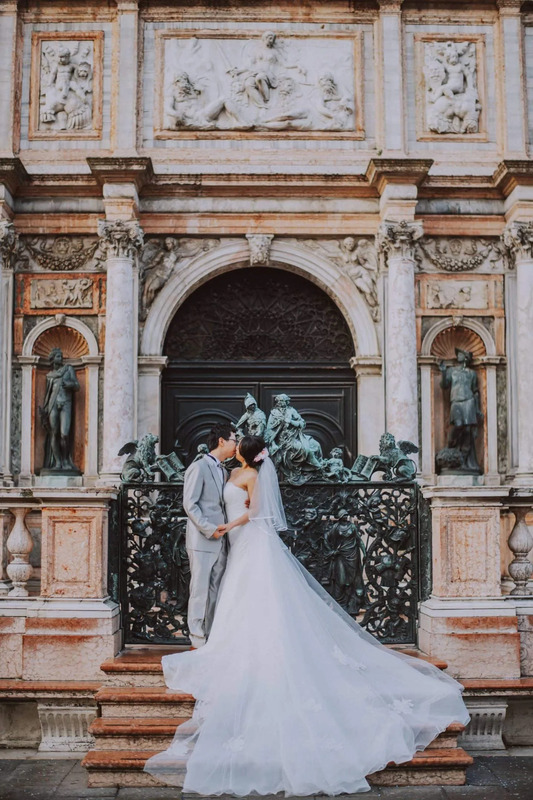 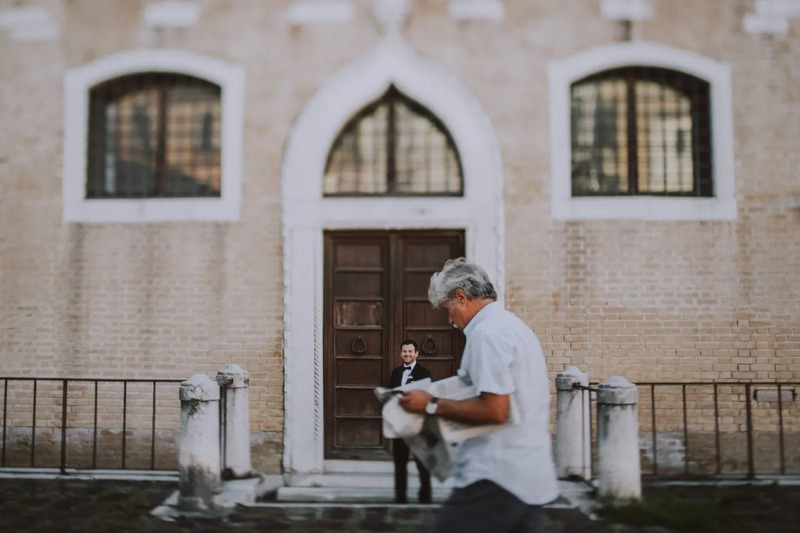 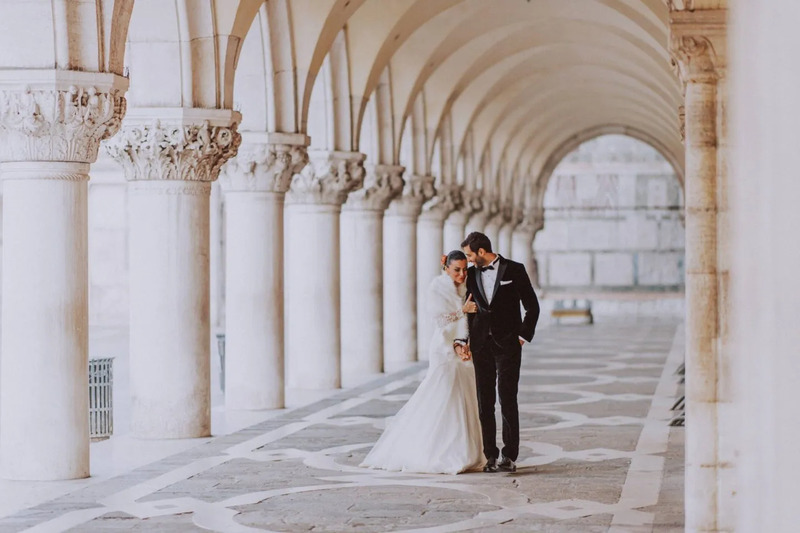 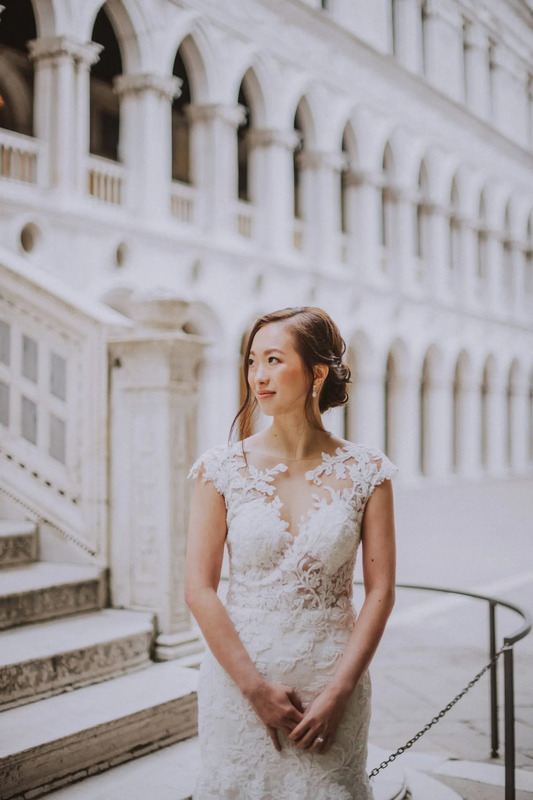 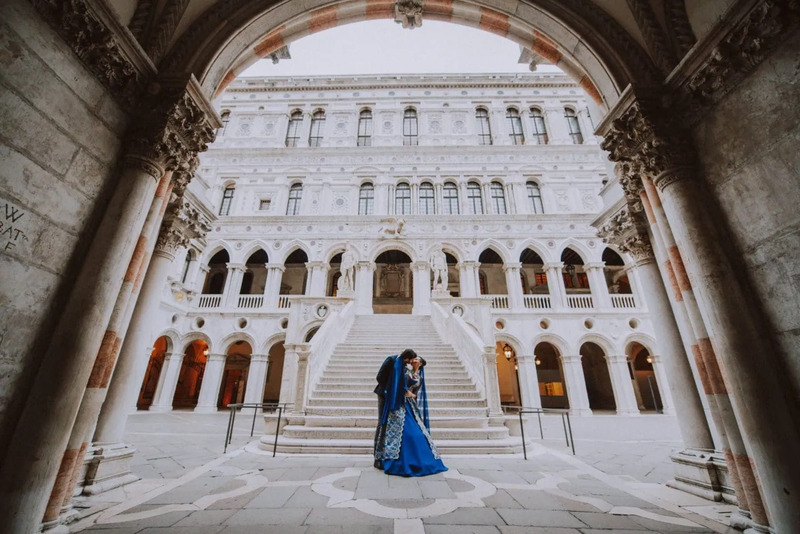 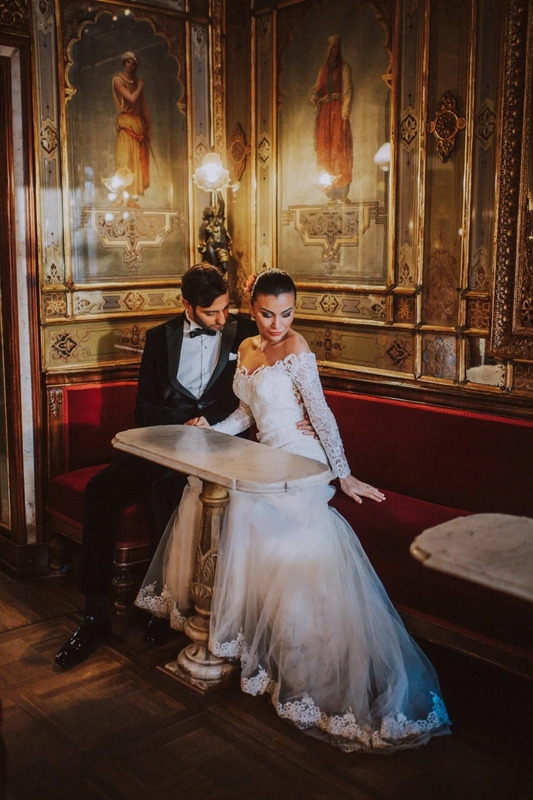 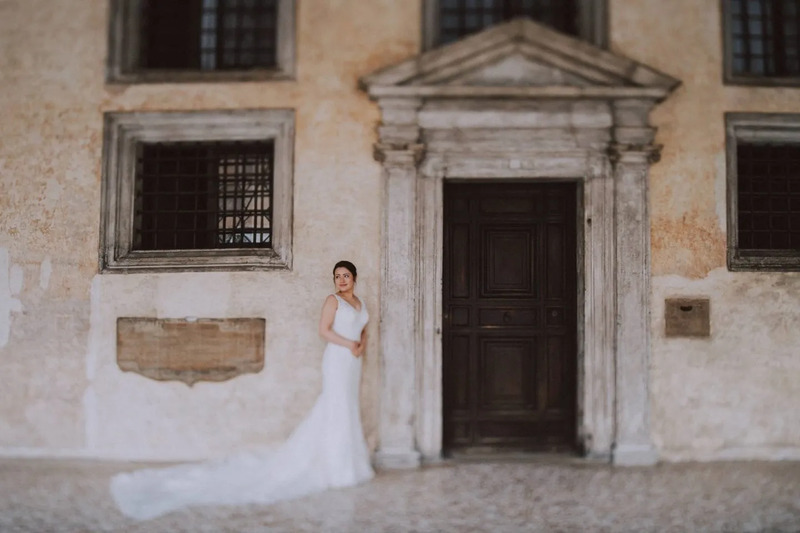 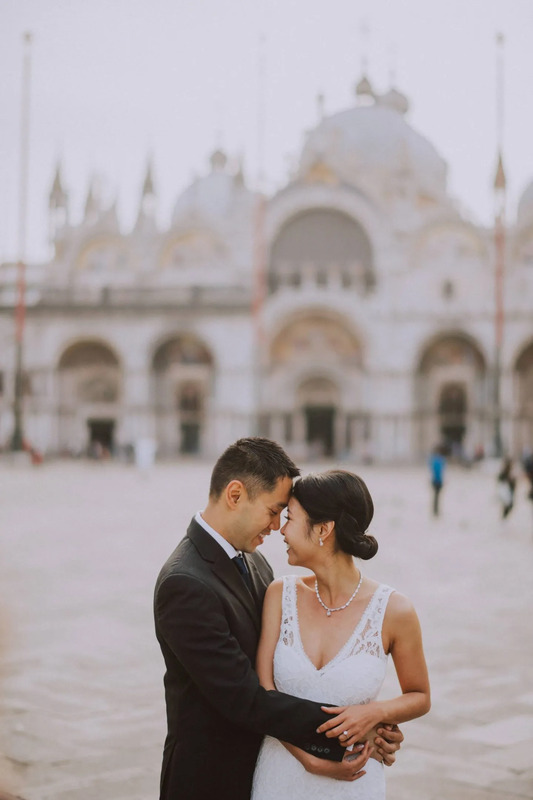 For this reason, let your Venice photographer lead you to the most beautiful and magical locations in Venice. 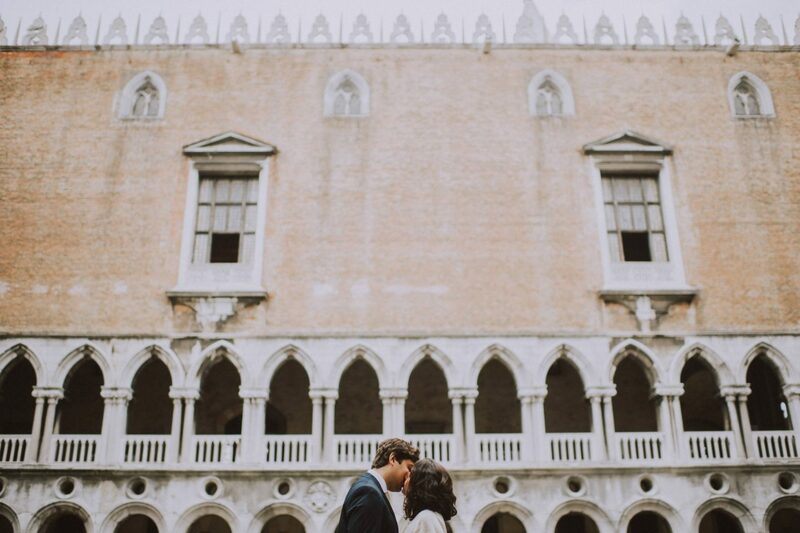 In the light of this, I’m here to help you and assist you to live your Venetian experience. 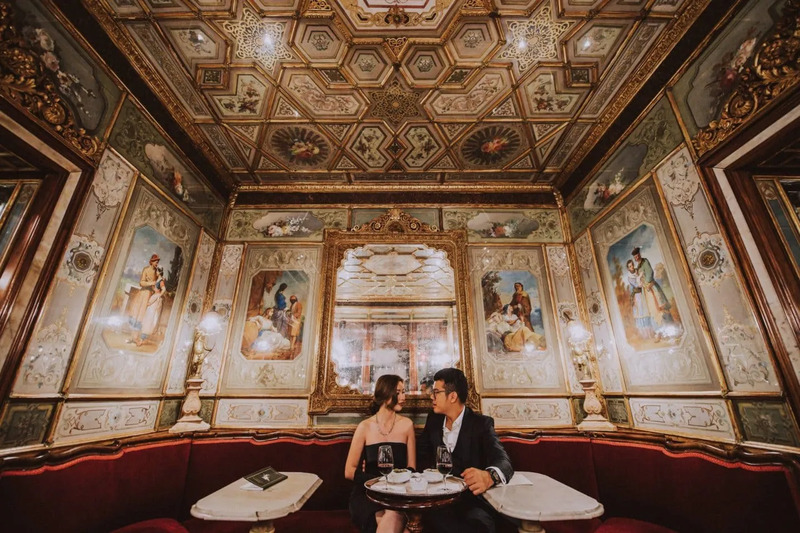 An experience which has to be lived at its best. 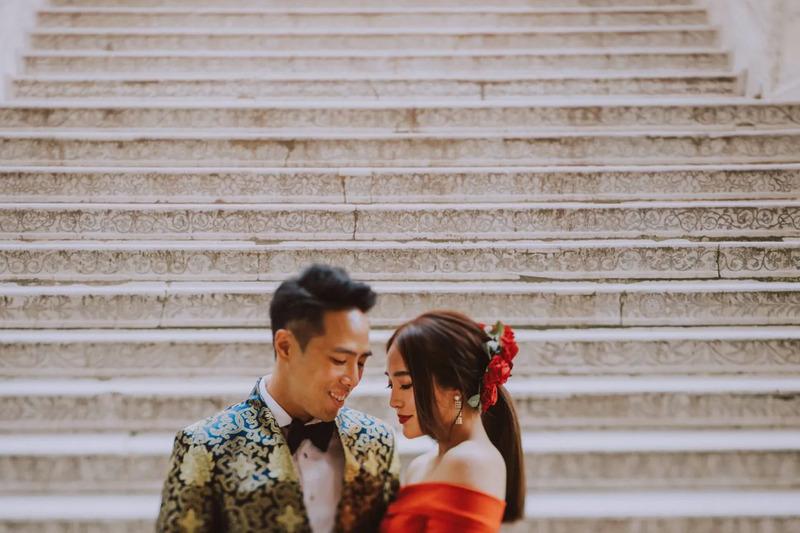 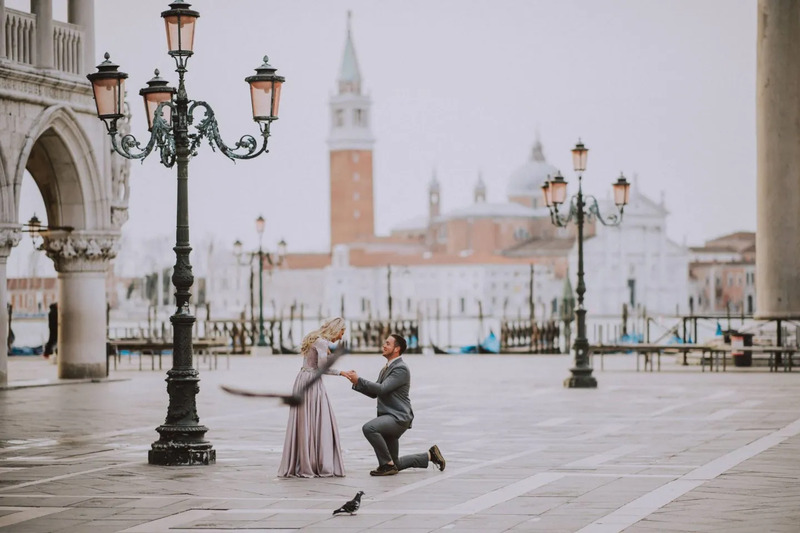 The engagement period, as well as the one immediate after having tied the knot, in other words the honeymoon period, it’s a sweet and special time in your relationship. 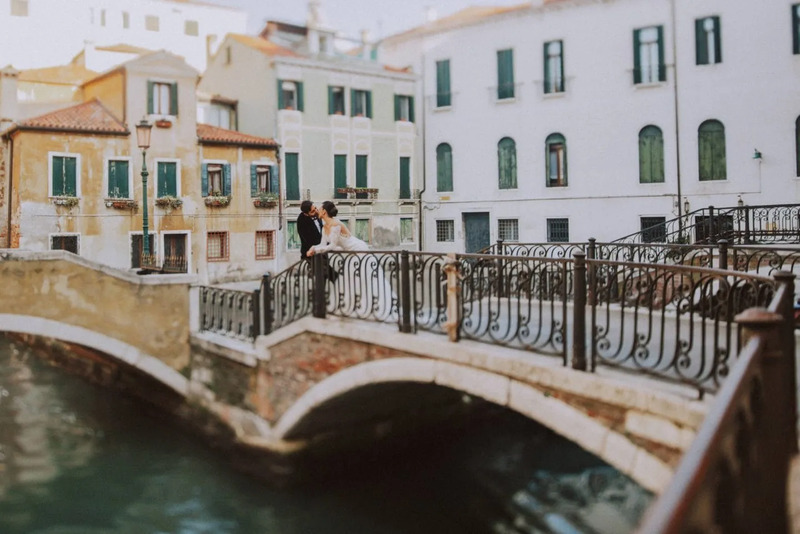 For this reason it is quite lovely to remember that with some romantic photos of you two as a couple. 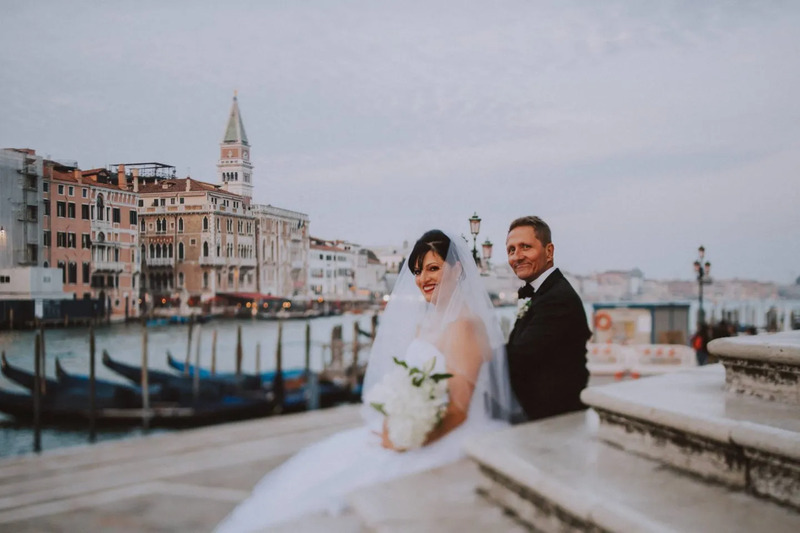 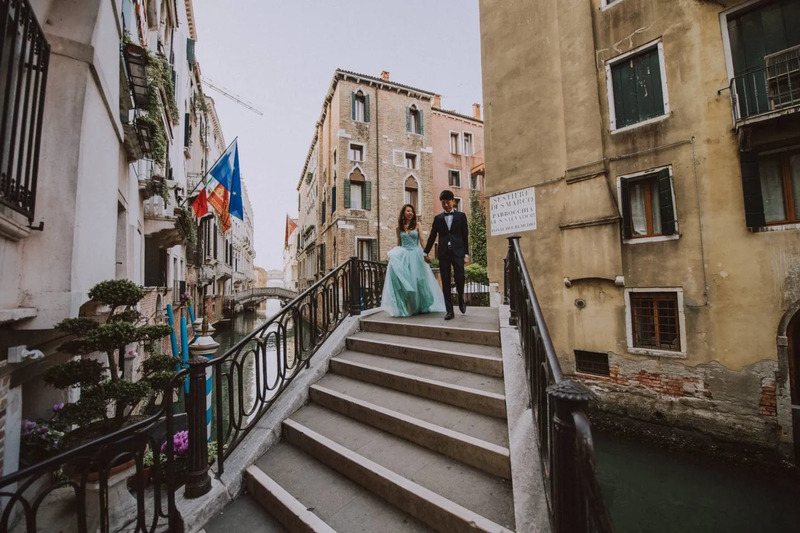 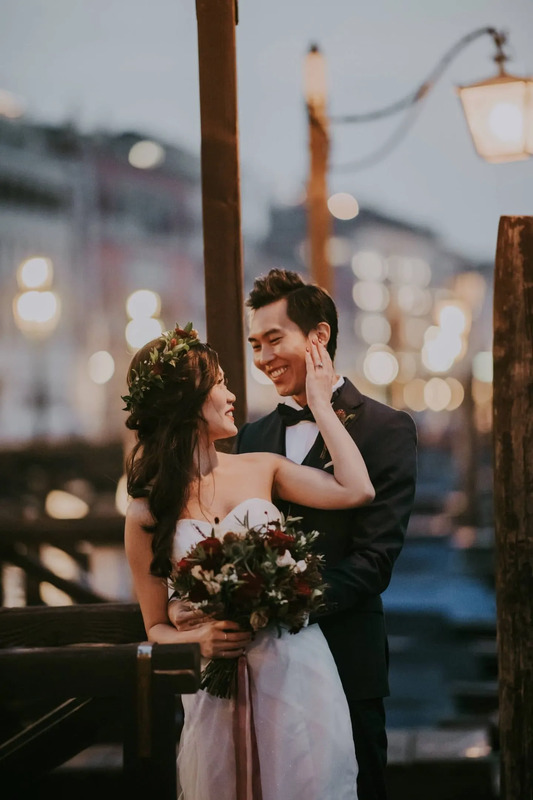 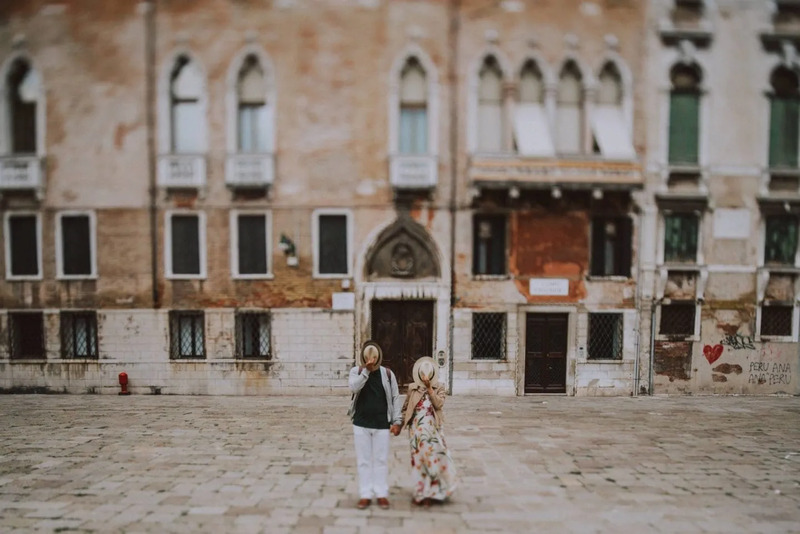 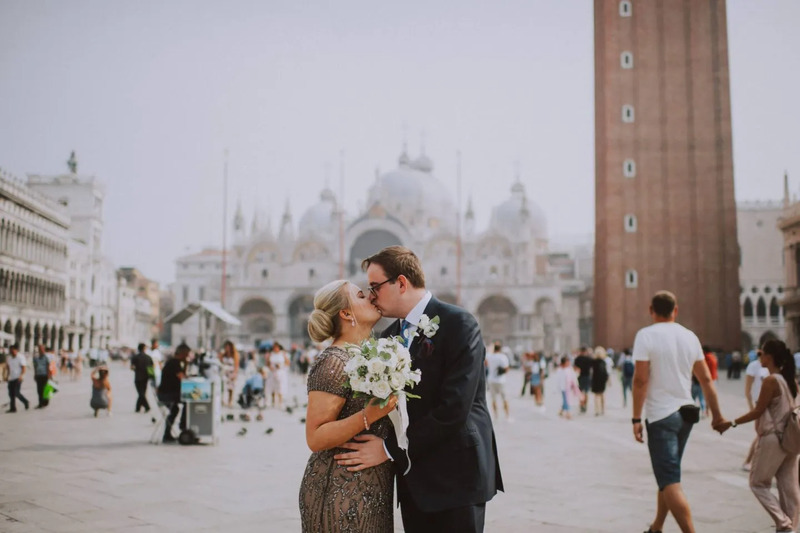 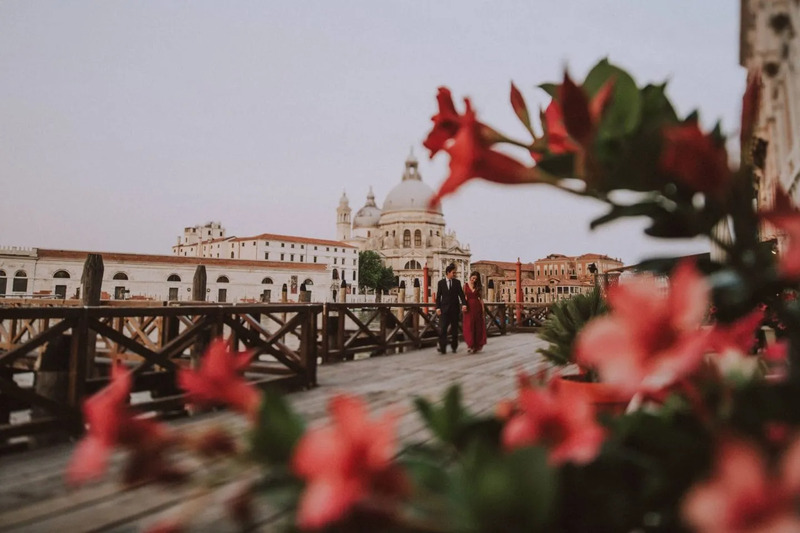 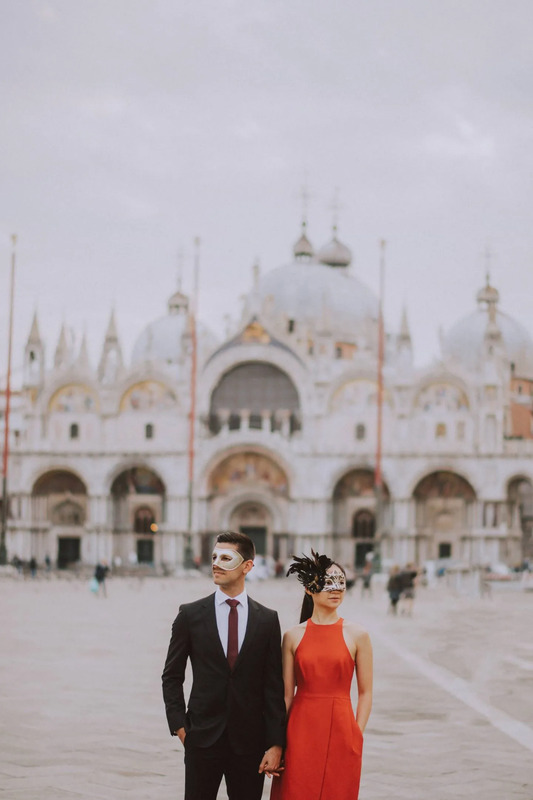 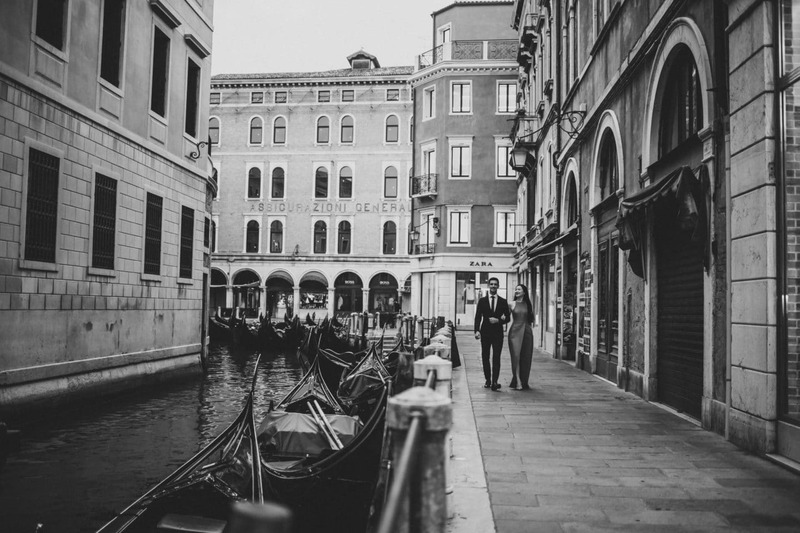 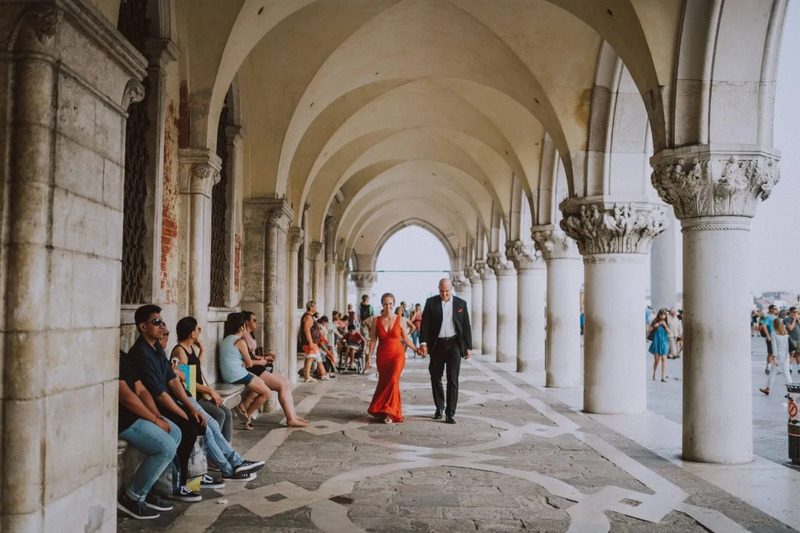 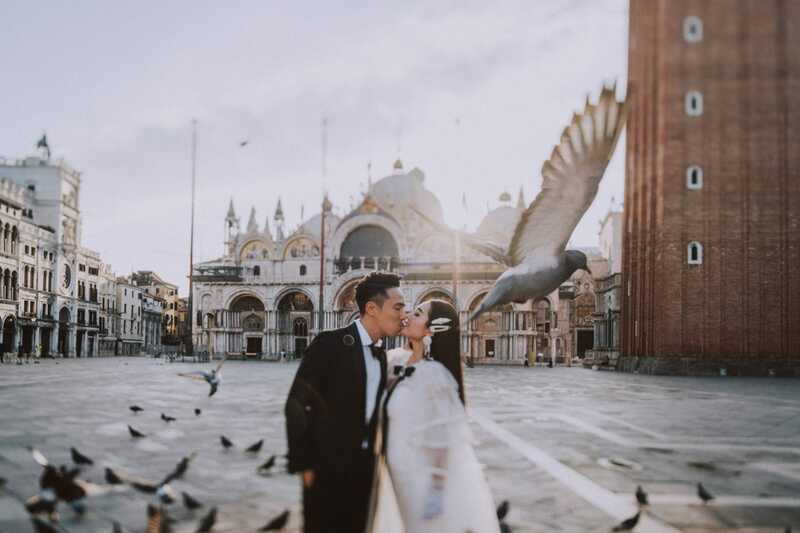 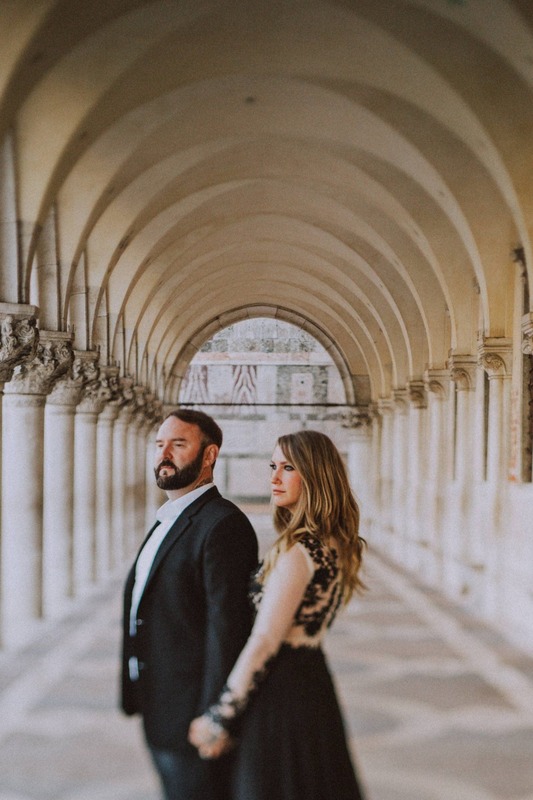 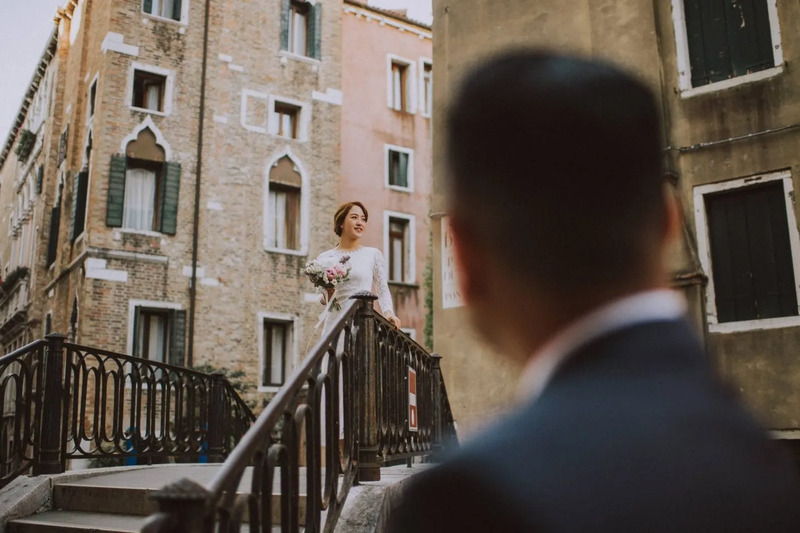 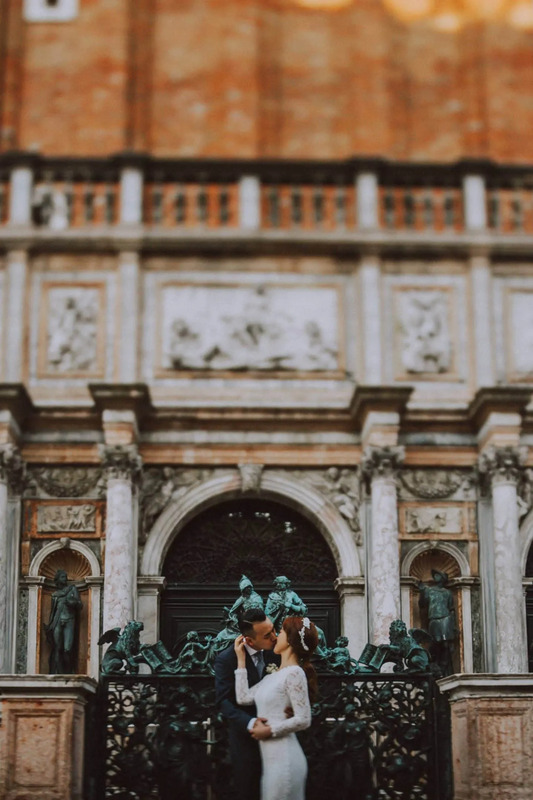 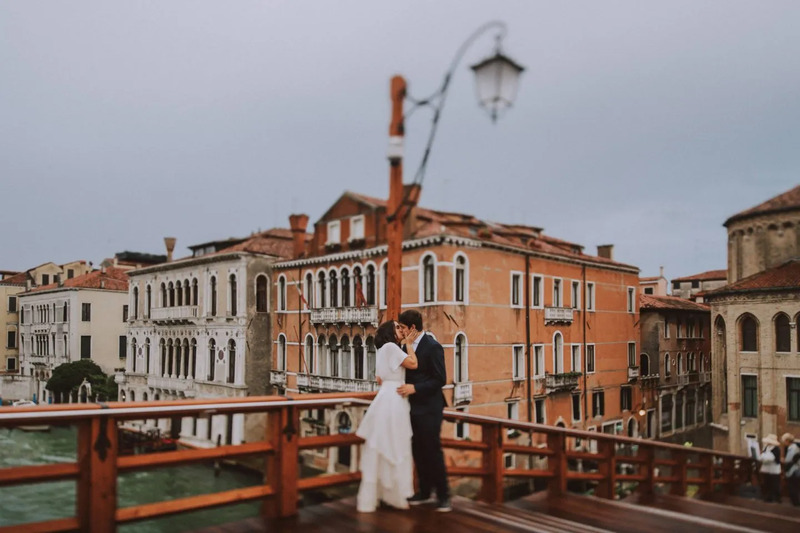 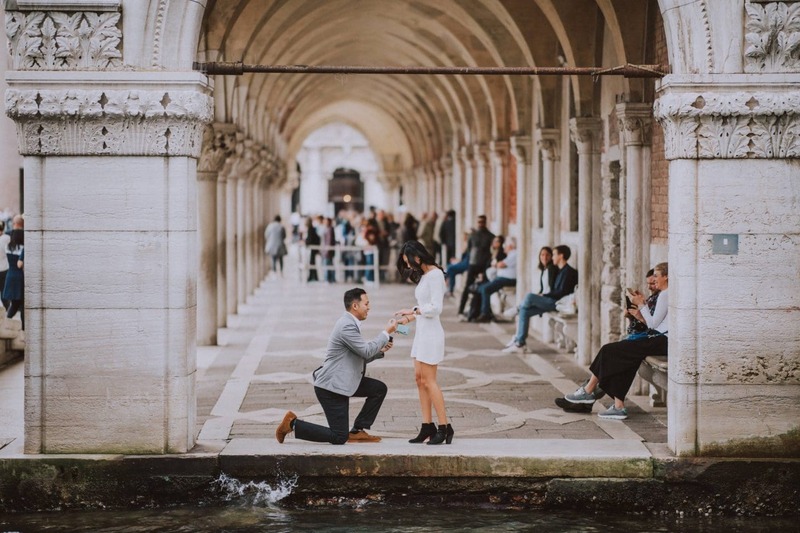 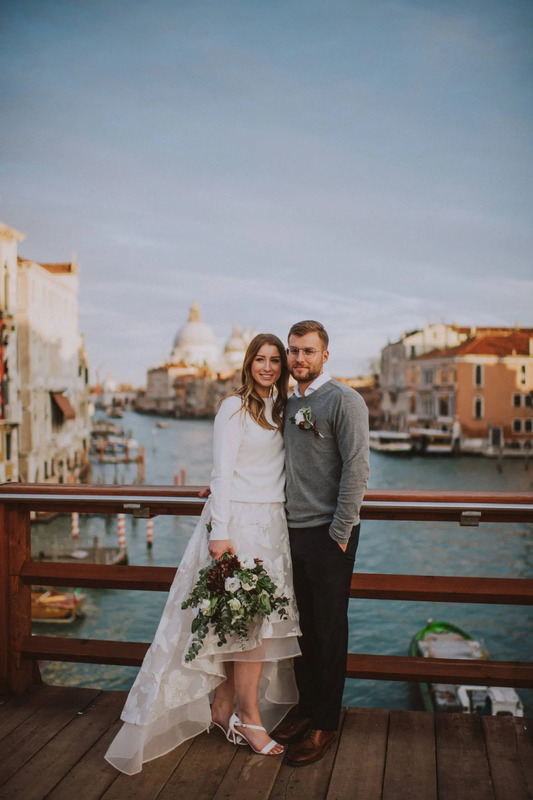 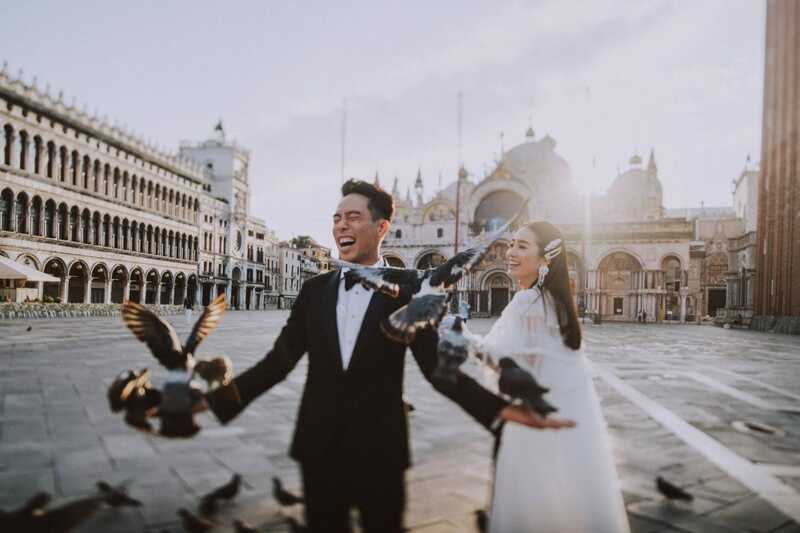 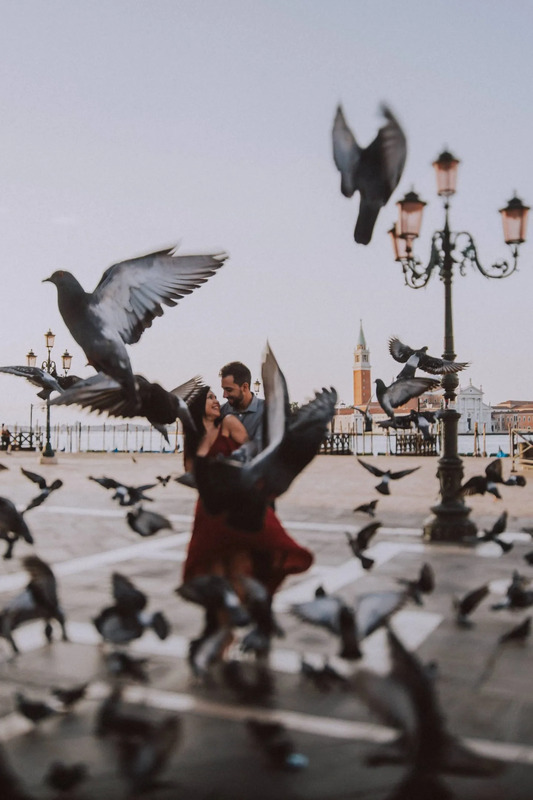 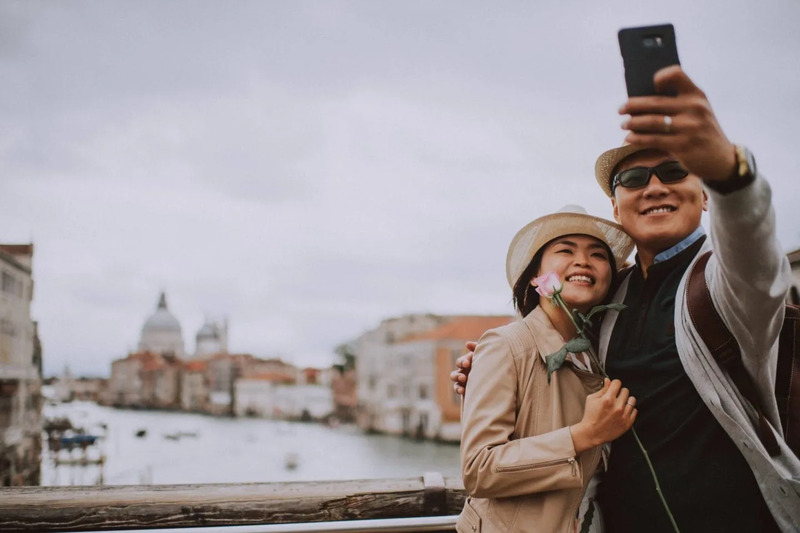 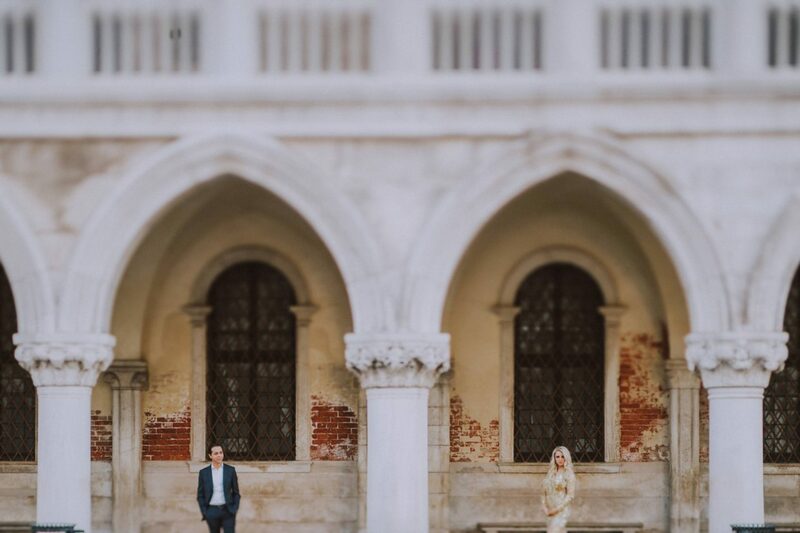 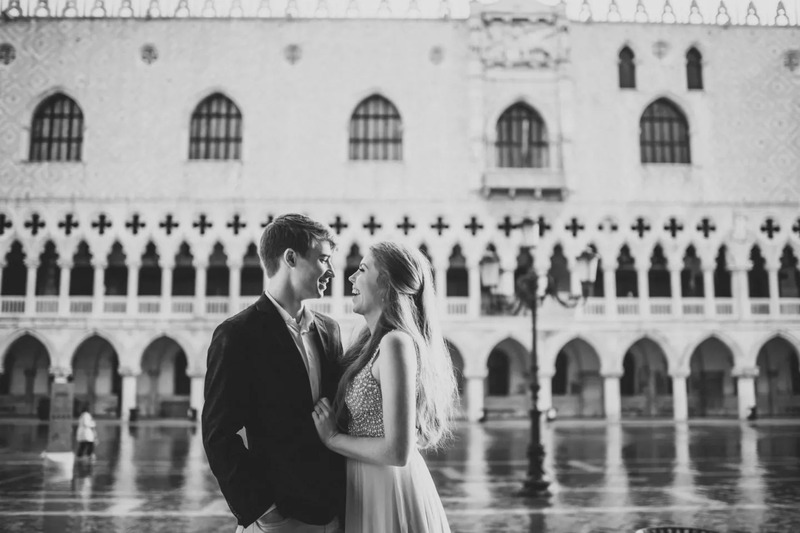 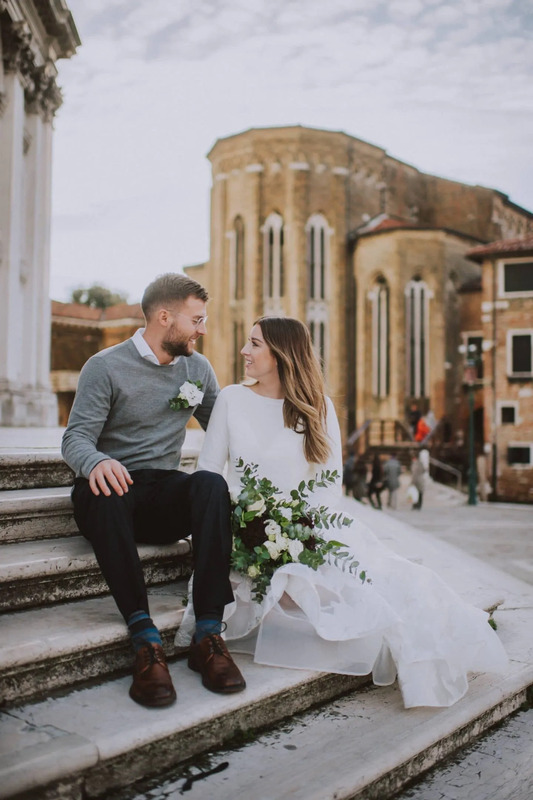 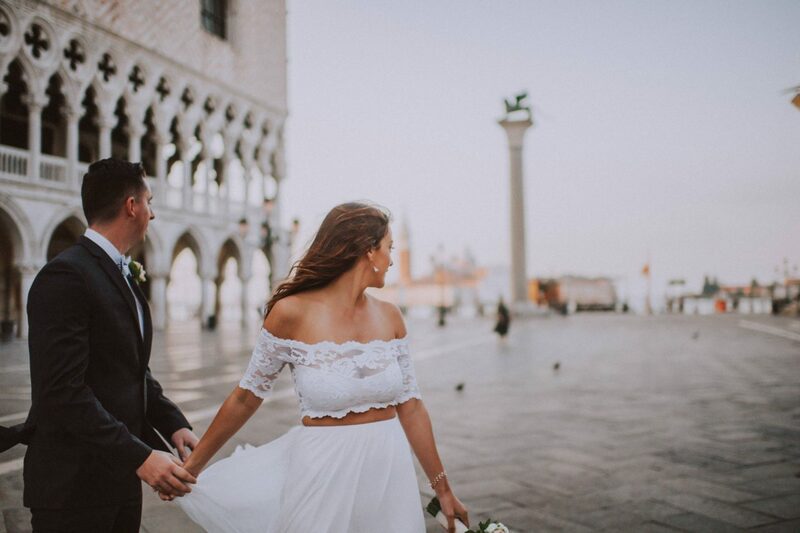 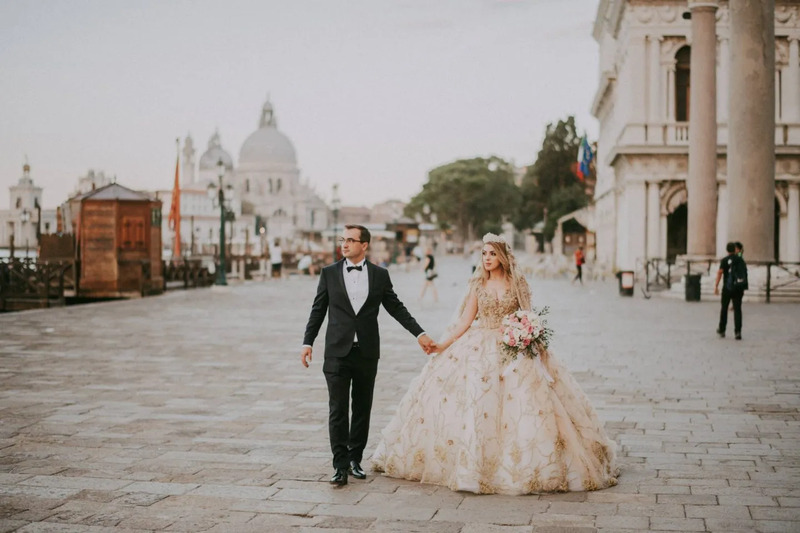 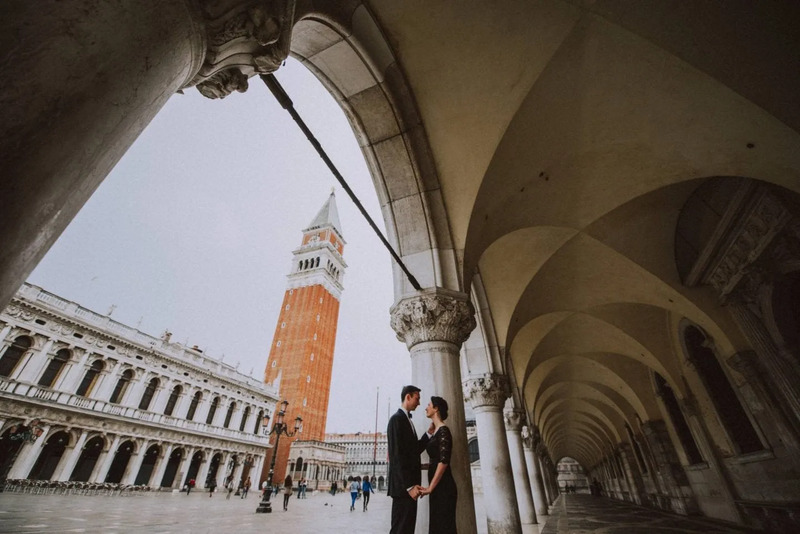 It must be remembered that, having some honeymoon, engagement or even anniversary photos taken in Venice is such a fantastic opportunity to keep such memories forever alive. 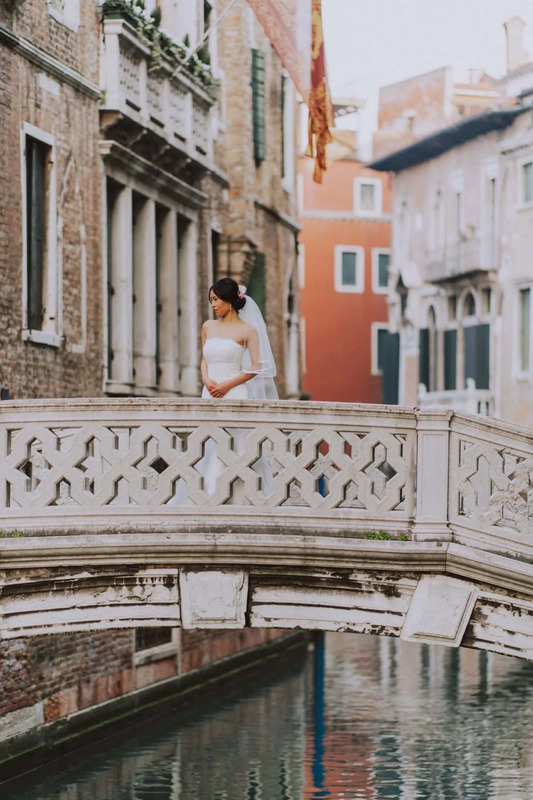 When in Venice, each twist and turn leads you another canal. 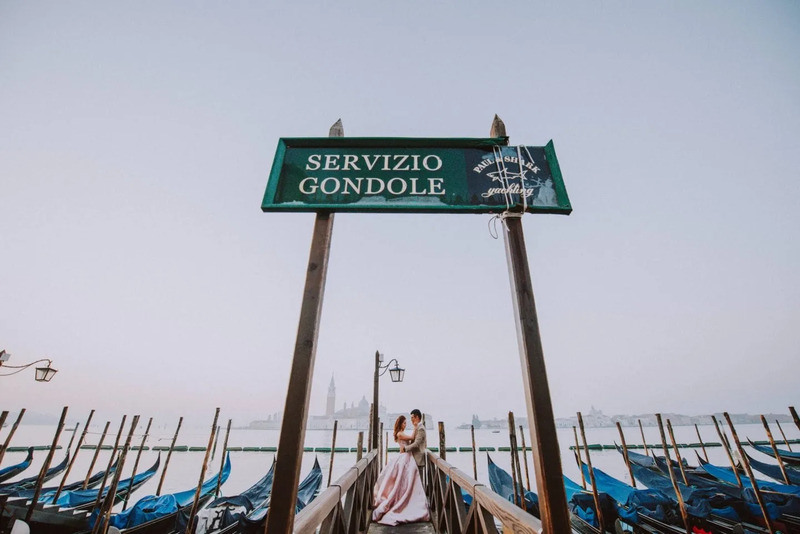 A canal where you will find boats parked, a gondola drifting by, some laundry hanging out to dry. 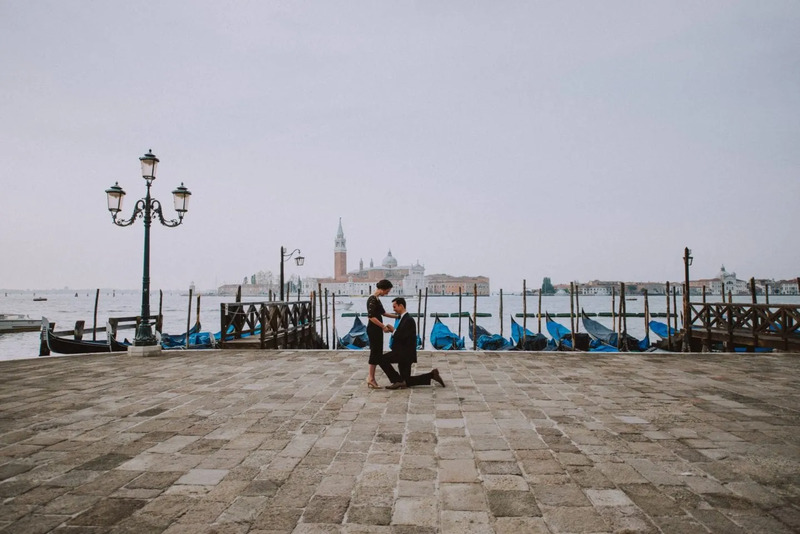 Close your eyes and just imagine. 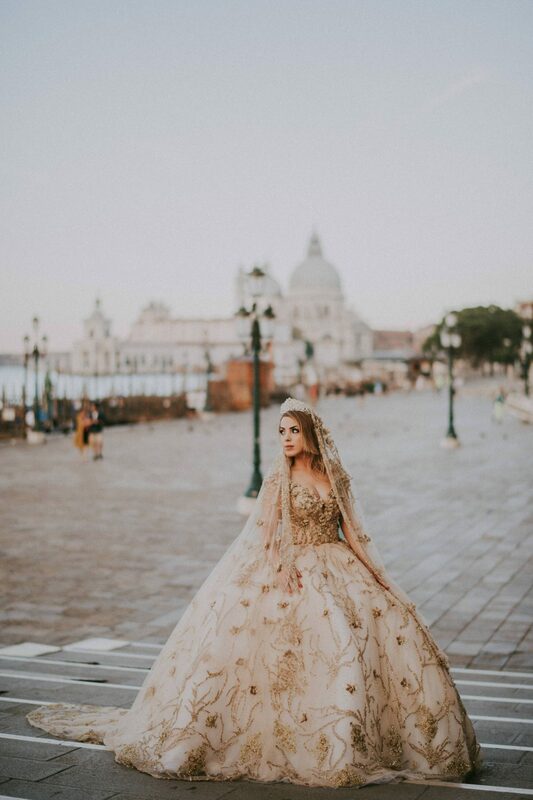 Isn’t this like a painting? 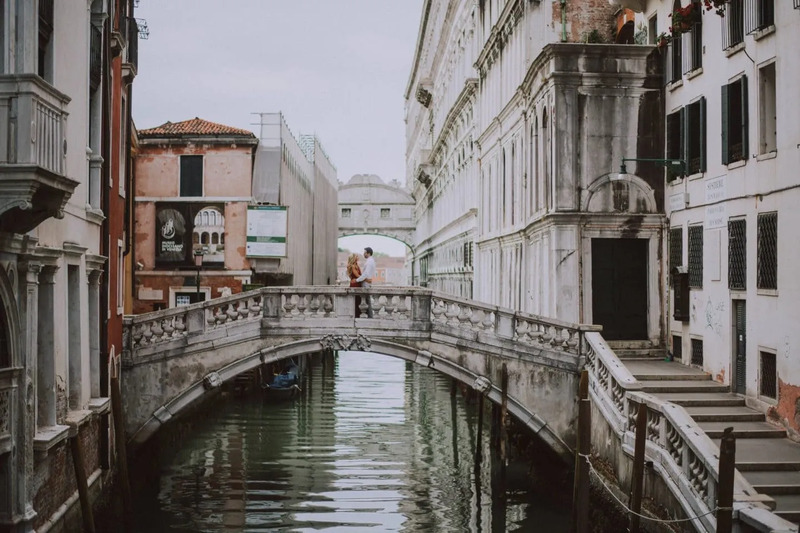 It is simply incredible how Venice is able to flood the imagination with an atmosphere of creative wonder. 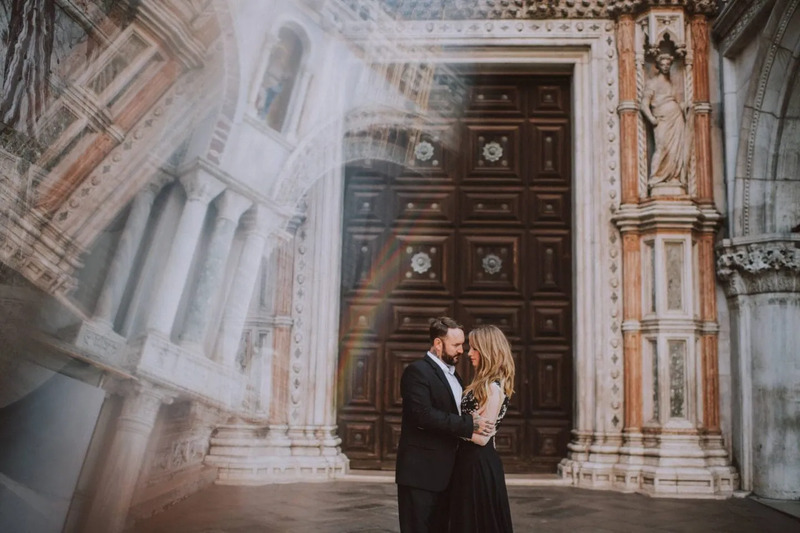 Mysterious and magical. 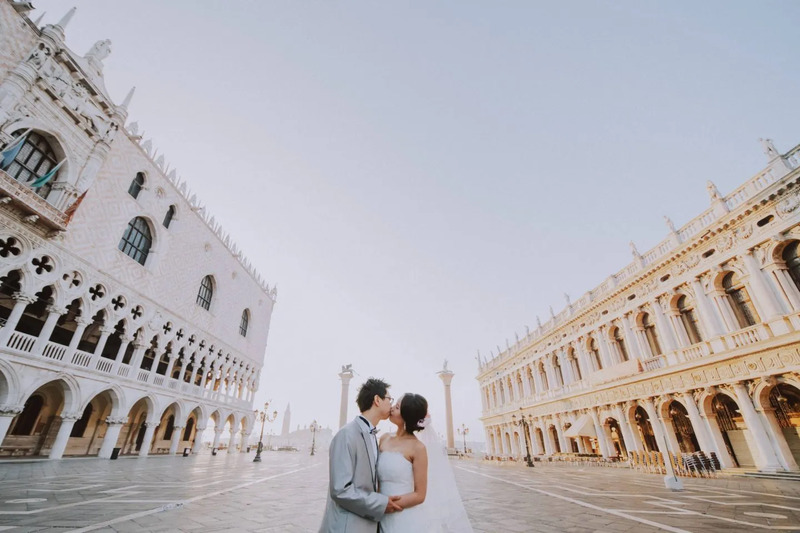 Every photographer’s heaven! 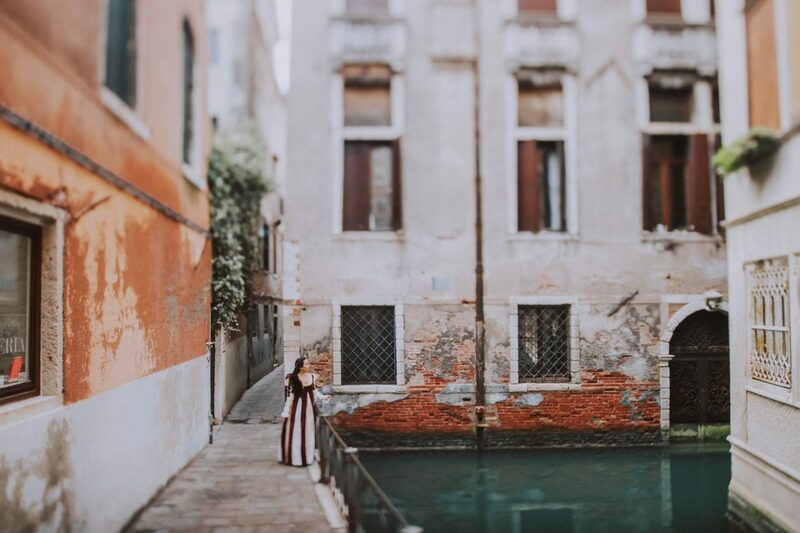 In my opinion, Venice is absolutely one of the most picturesque and photogenic cities in the world. 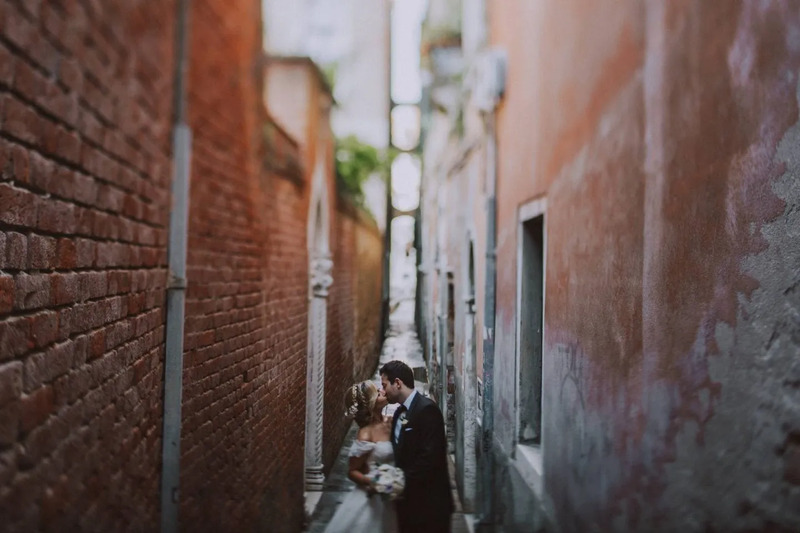 Every corner is a great photo opportunity indeed, the photography possibilities are literally endless. 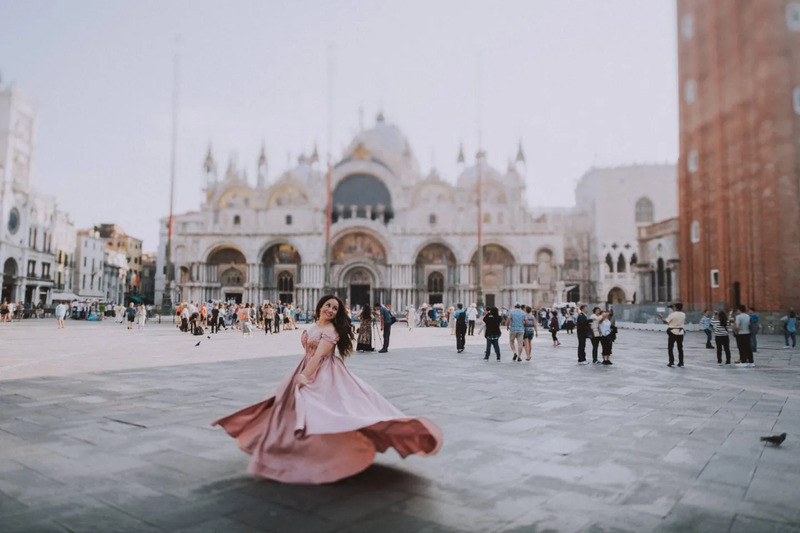 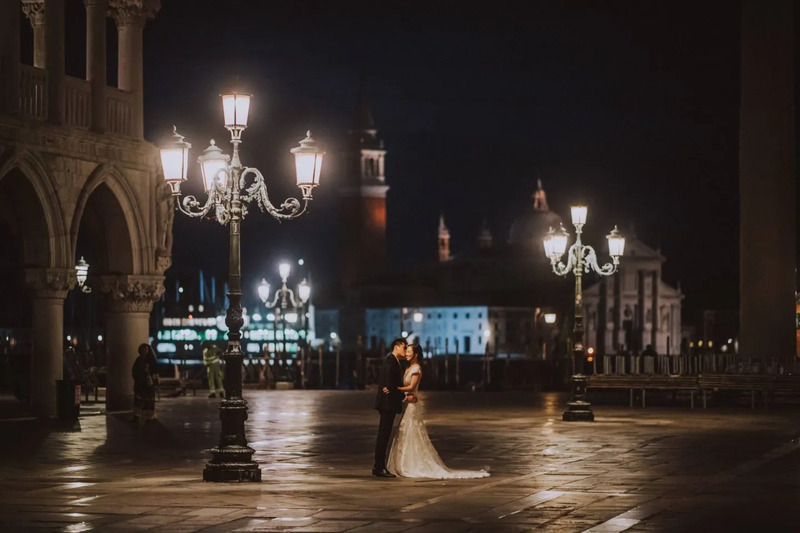 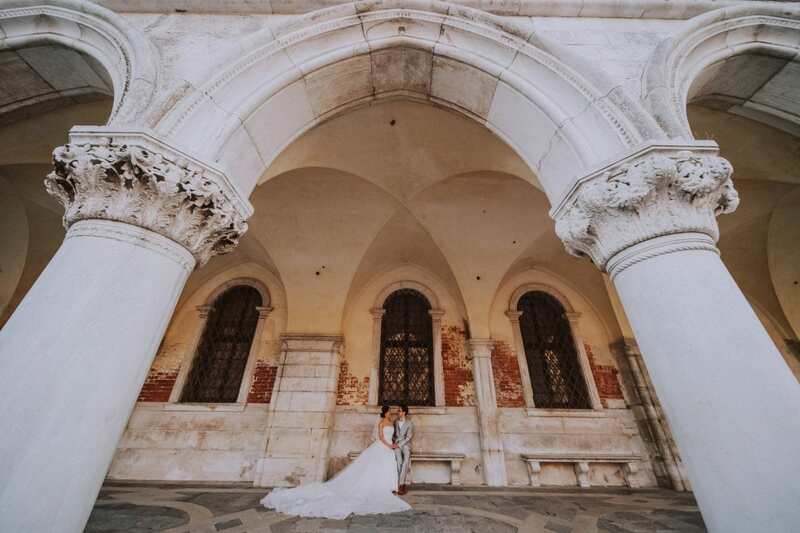 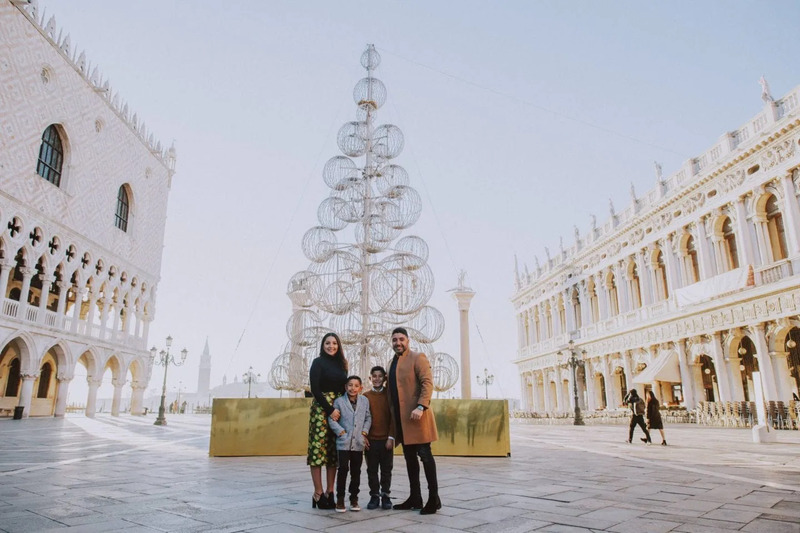 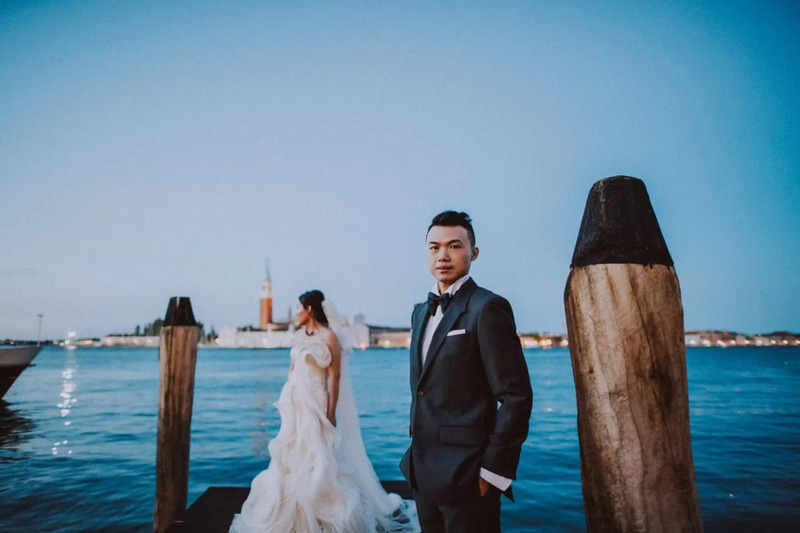 In the light of this, after having mentioned what is the best time to have your photoshoot in Venice, referring also on the advantages of having the photoshoot in Venice also by night, I wanted to make a list of the most beautiful places in Venice. 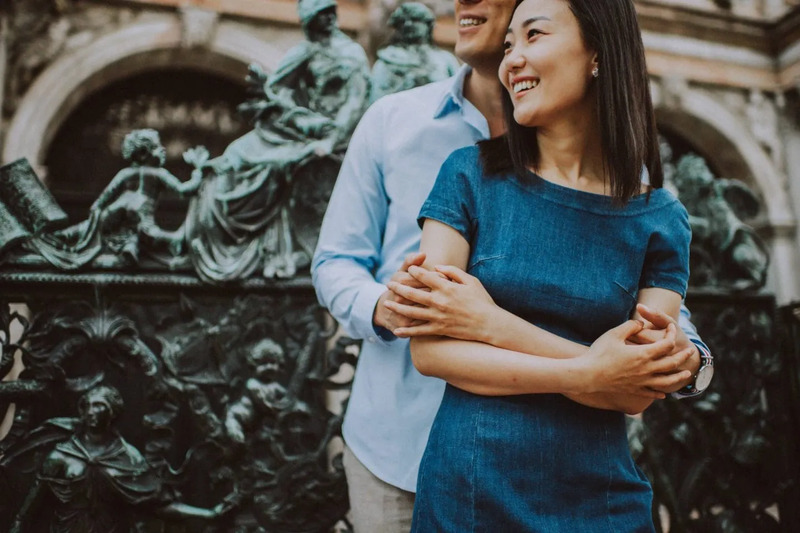 I really care a lot about my couples. 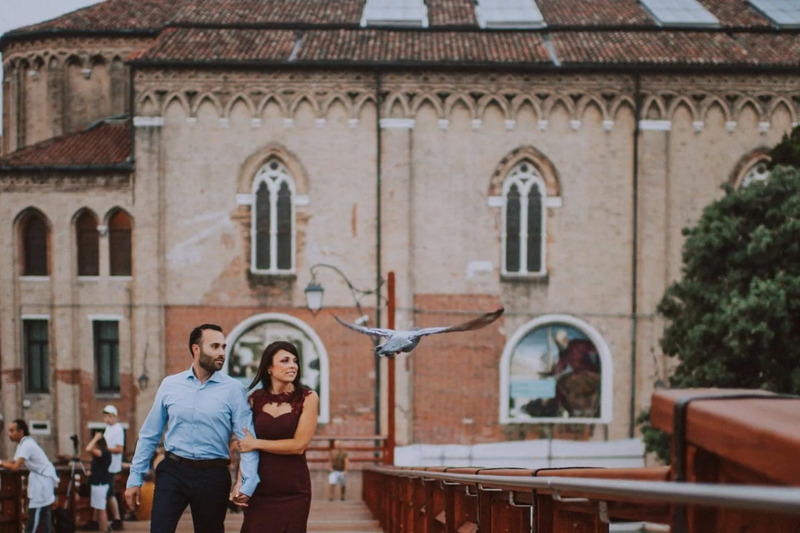 Each of them is special and unique. 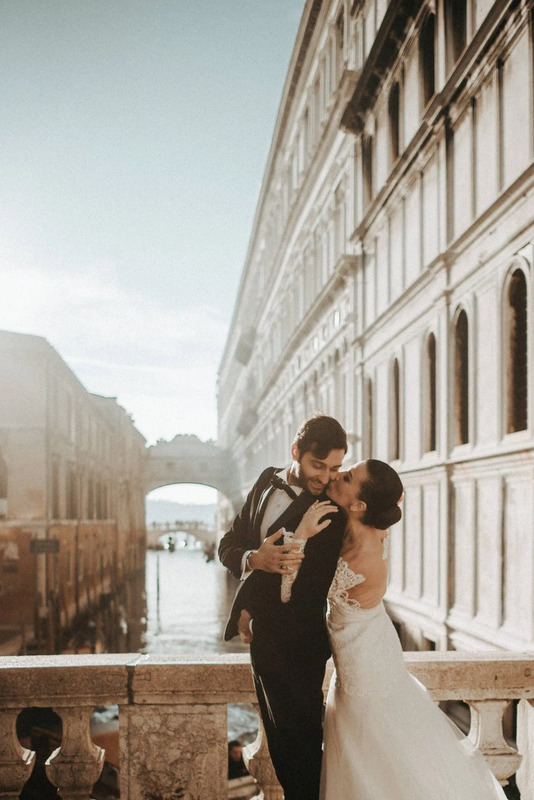 For this reason, I want to ensure them the very best photographic experience during our time spent together in Venice. 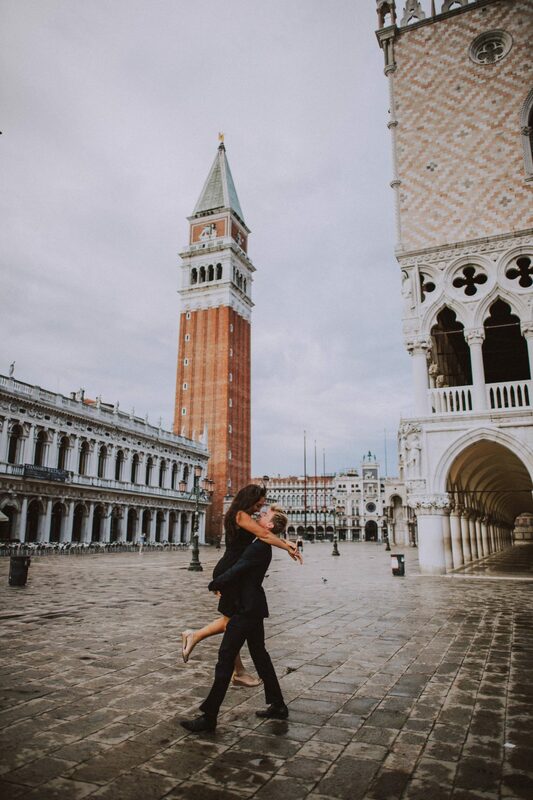 With attention to this, I absolutely don’t want to miss them what are, in my opinion, the most iconic locations. 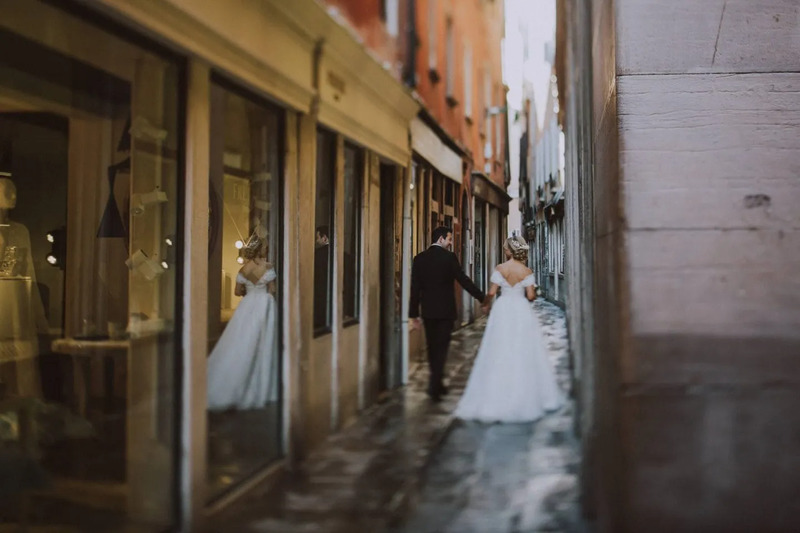 Be guided by your Venice photographer among not only the best but also the most beautiful spots in Venice. 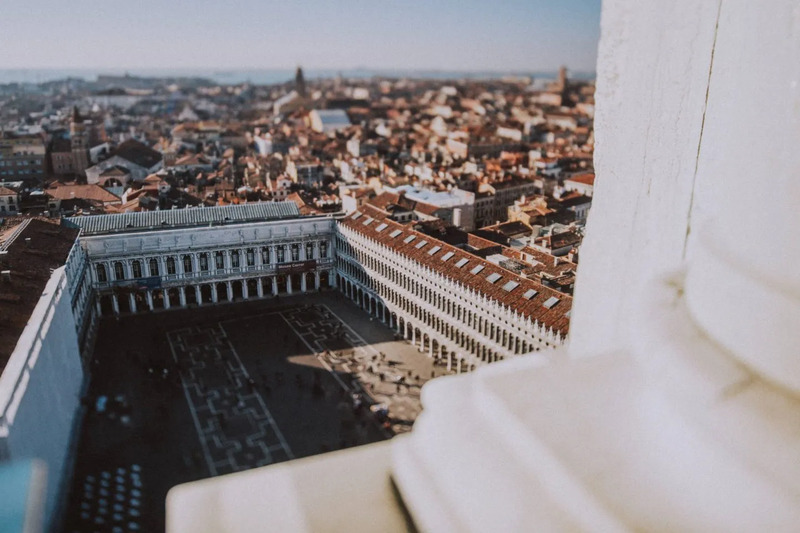 To begin with, if you truly want to get how stunning this city is, you need to get on top of it. 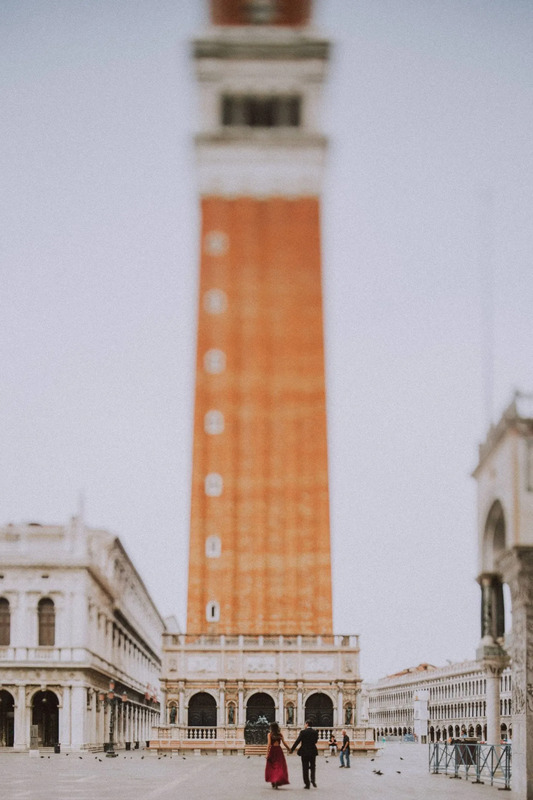 In fact, taking a lift 160ft up to St Mark’s bell tower’s peak will do just that. 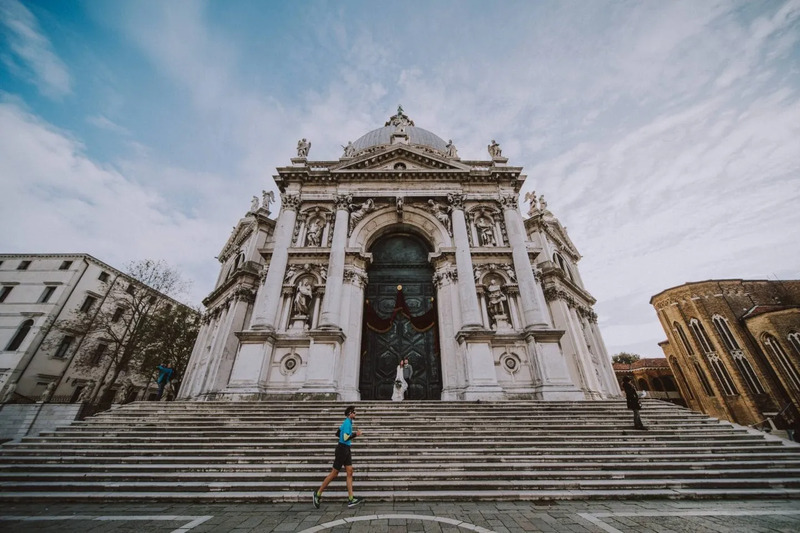 It is part of the homonymous basilica giving in addition, its name also to the square that houses it. 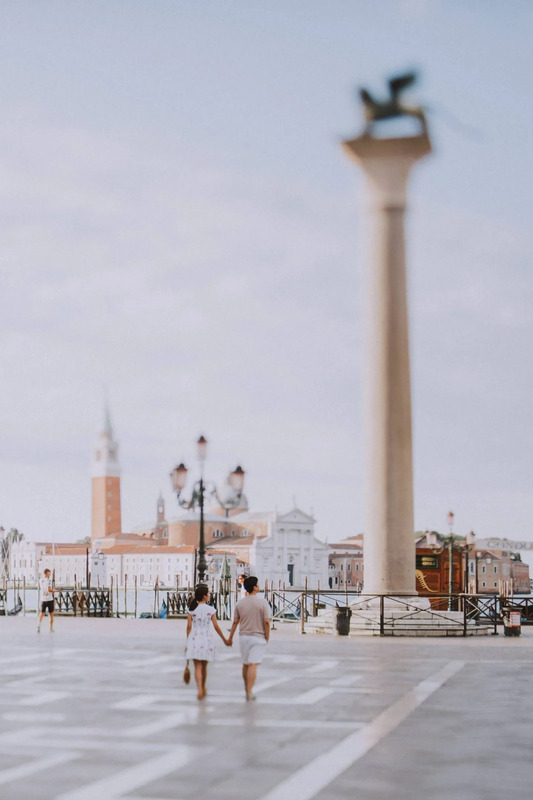 Located in front of the sea, it is to the sea that St Mark’s bell tower owes its construction. 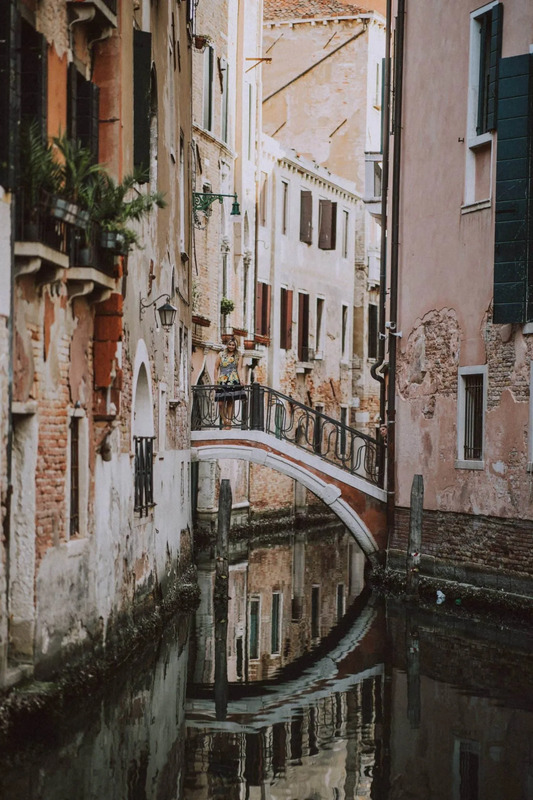 In fact, its construction started on a previous tower structure that had the function of sighting pirates and enemy ships. 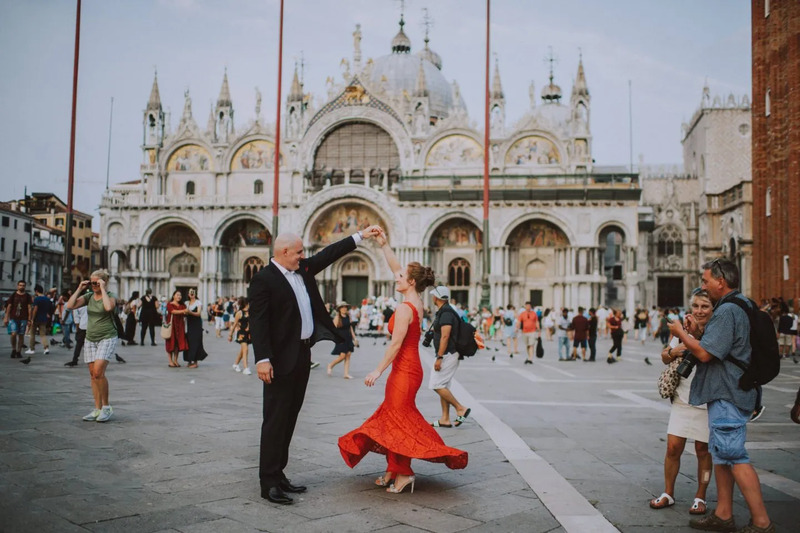 Even though it is not possible to go up there with your Venice photographer, I just had to mention it. 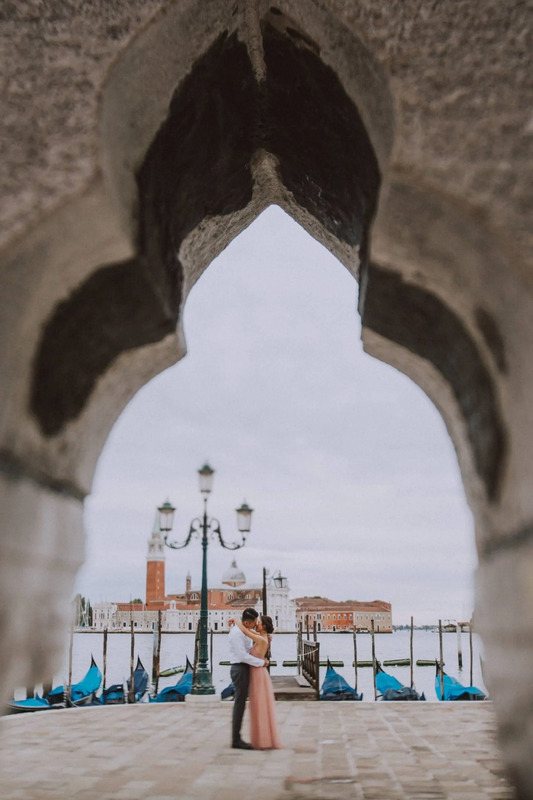 St Mark’s bell tower is certainly considered one of the symbols of Venice. 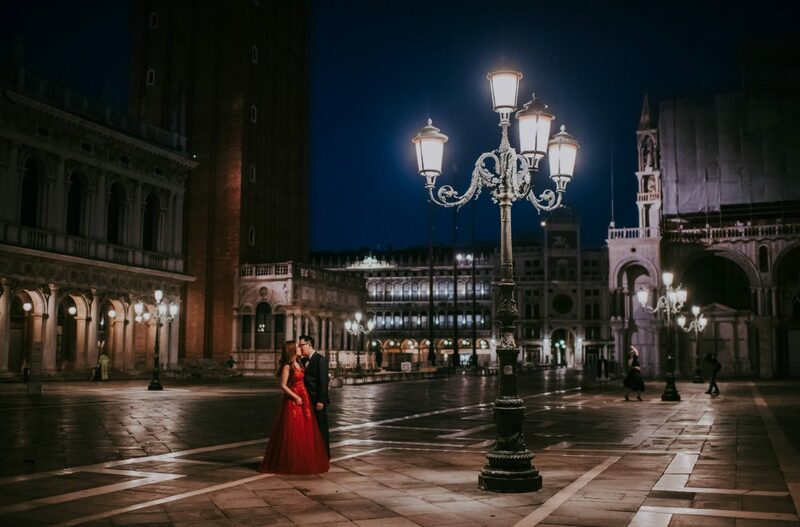 You simply can’t miss it! 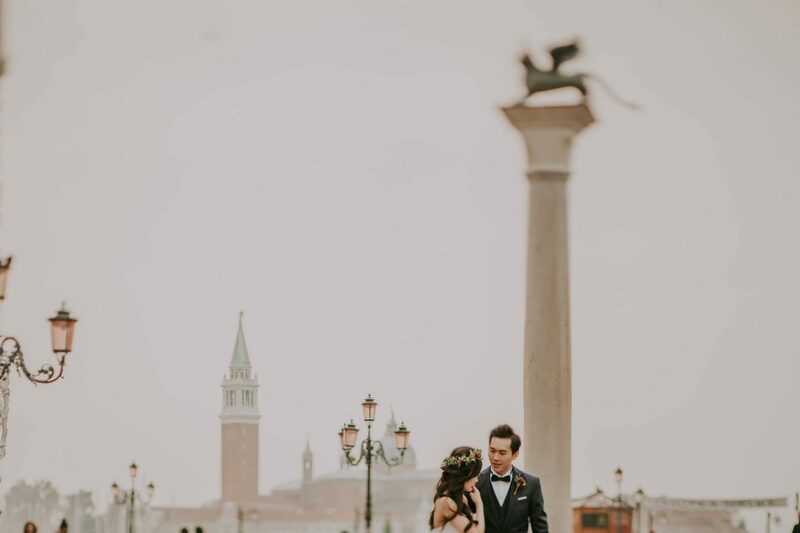 Together with St Mark’s bell tower, St Mark’s square is absolutely the most iconic location in Venice. 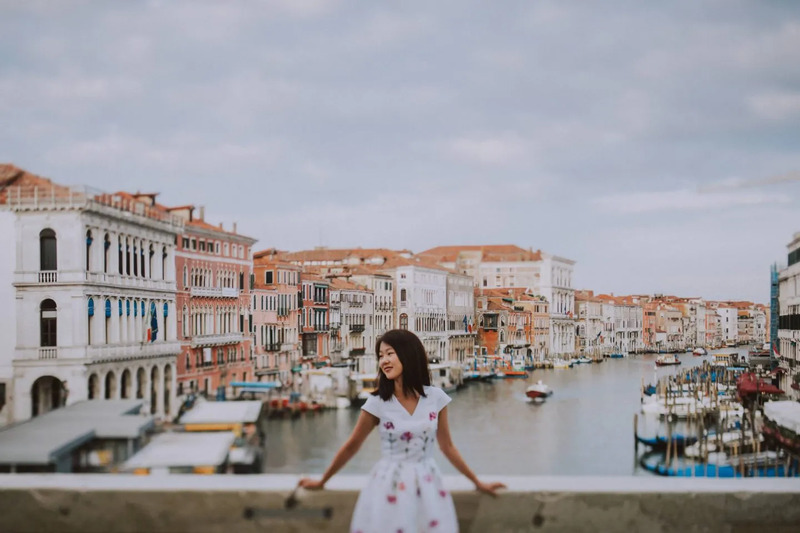 As a result, it is the center of tourism on the island. 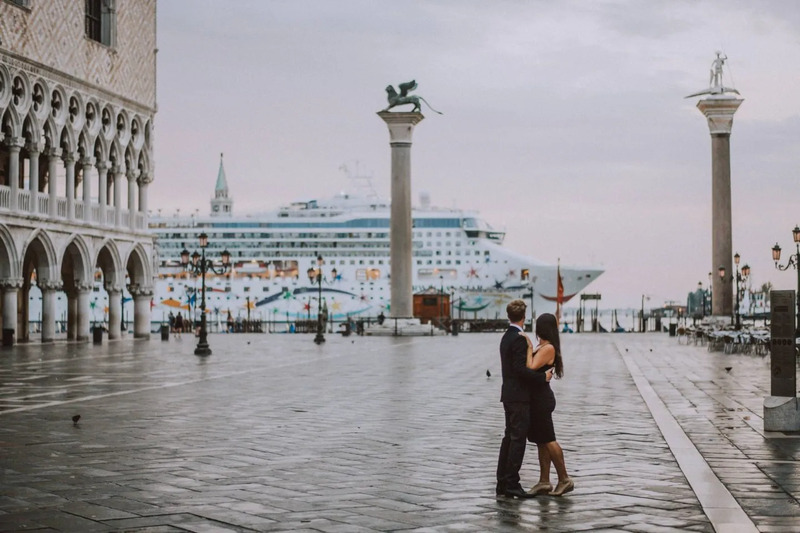 For this reason it gets really crowded. 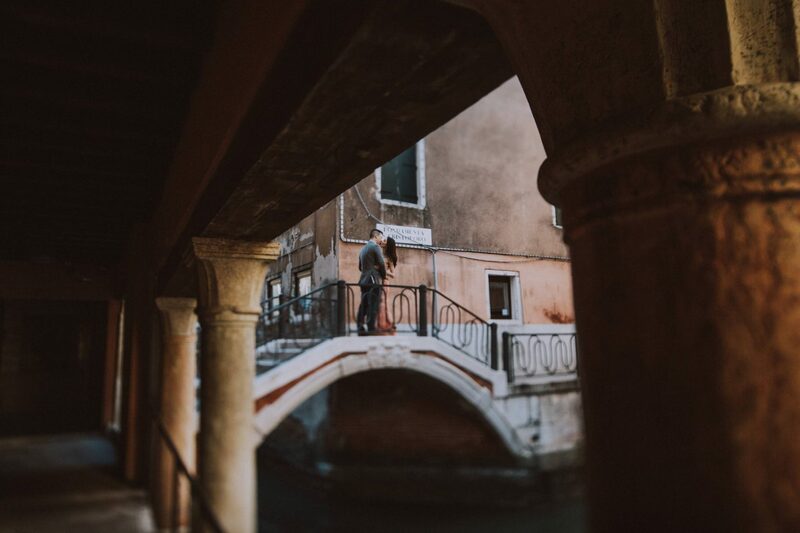 Taking beautiful and romantic photos there during the day is pretty challenging. 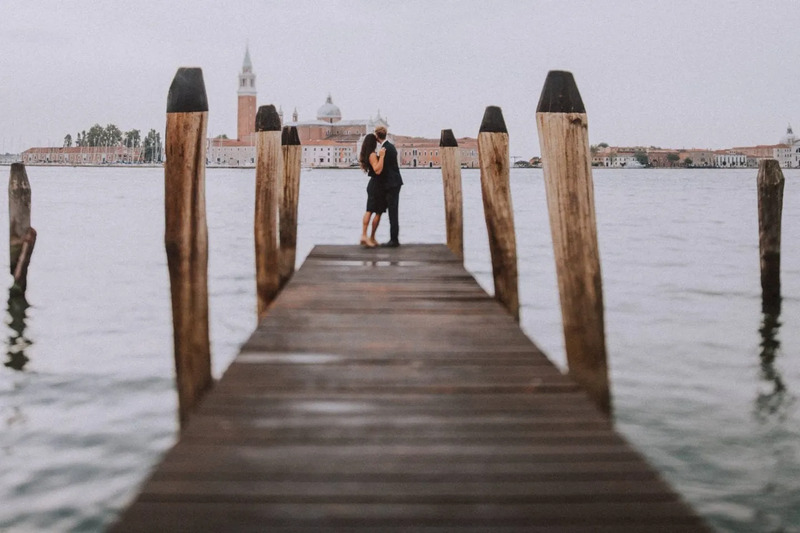 This is why I always recommend to meet up early in the morning. 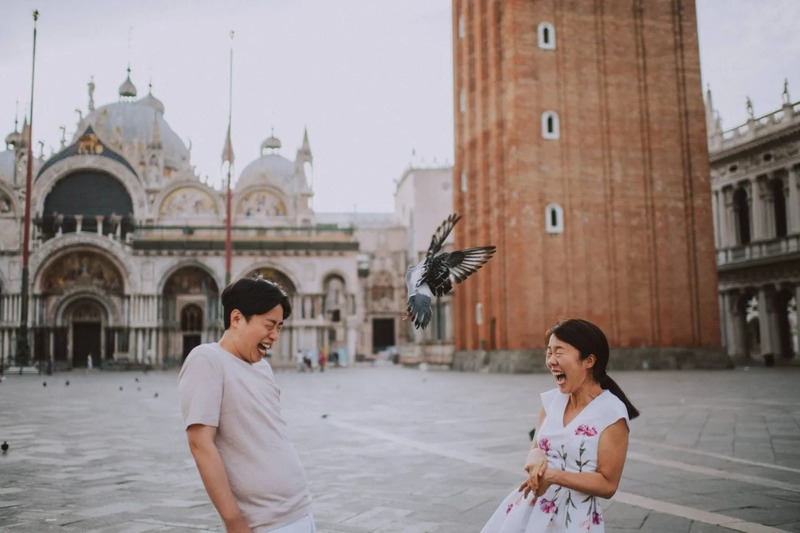 With attention to this, below you can see some photos taken in St Mark’s square in different situations. 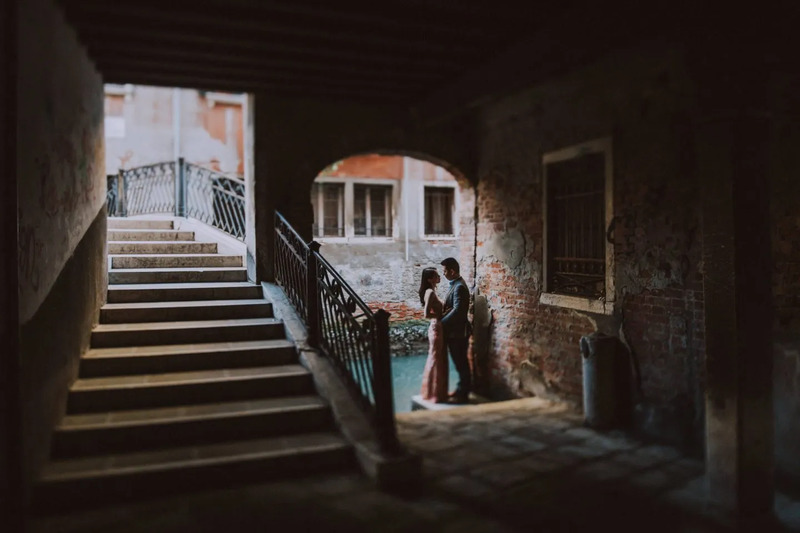 There is a common question I am often asked. 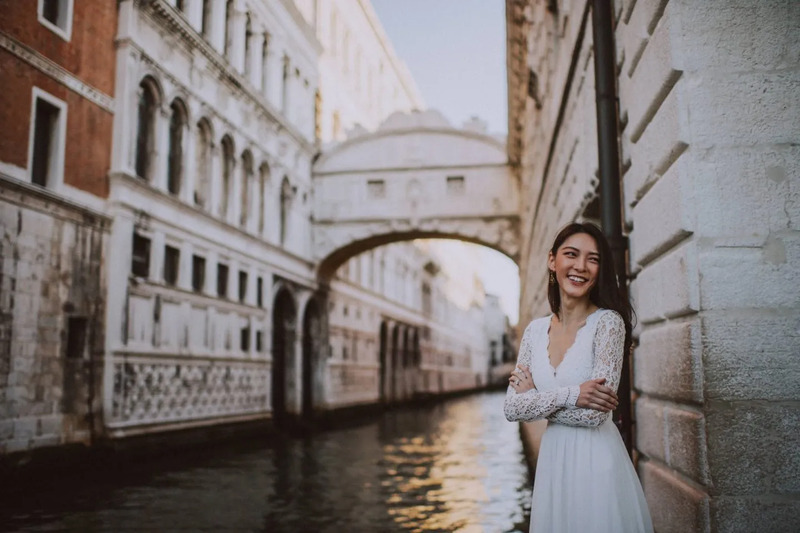 What is the main difference between taking photos early in the morning or anytime during the day? 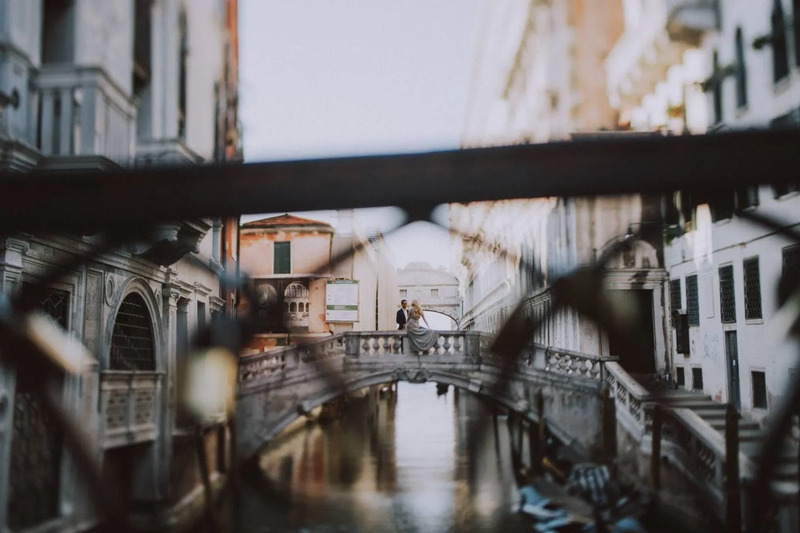 Let these photos give you the idea. 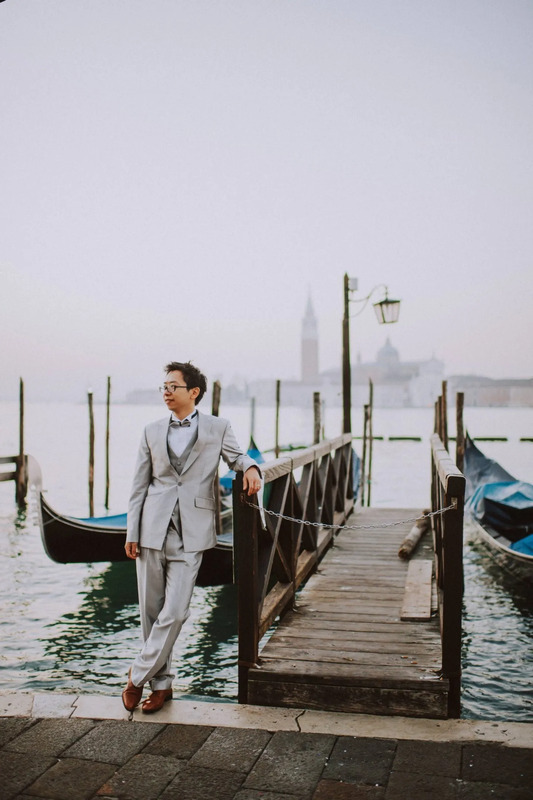 In any case, midday or afternoon – I always do my best to obtain the very best result. 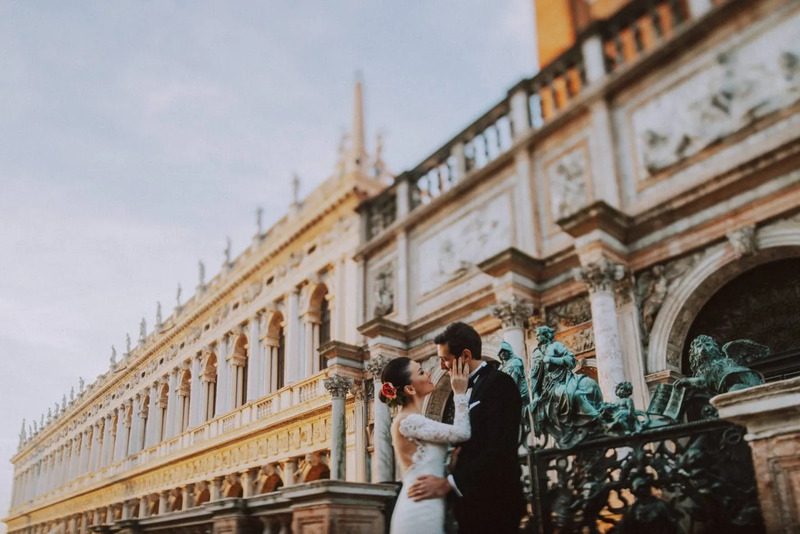 Three centuries of love, history and art. 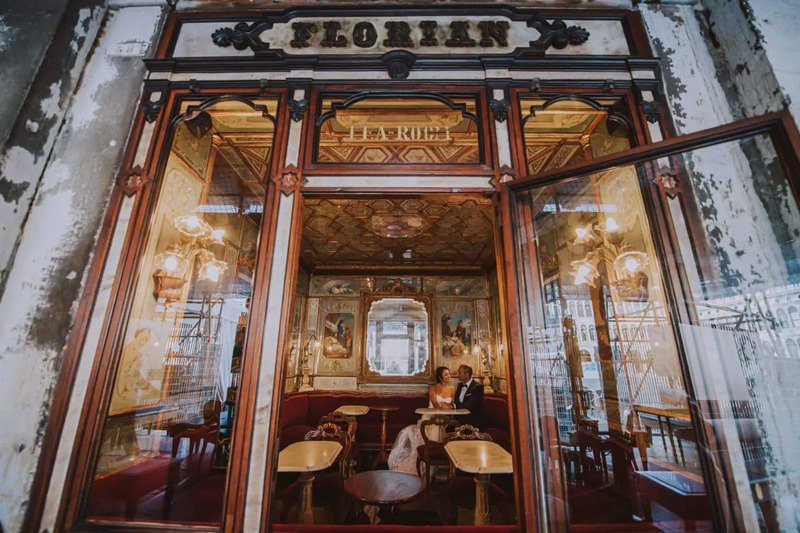 Caffe Florian is the oldest service café worldwide. 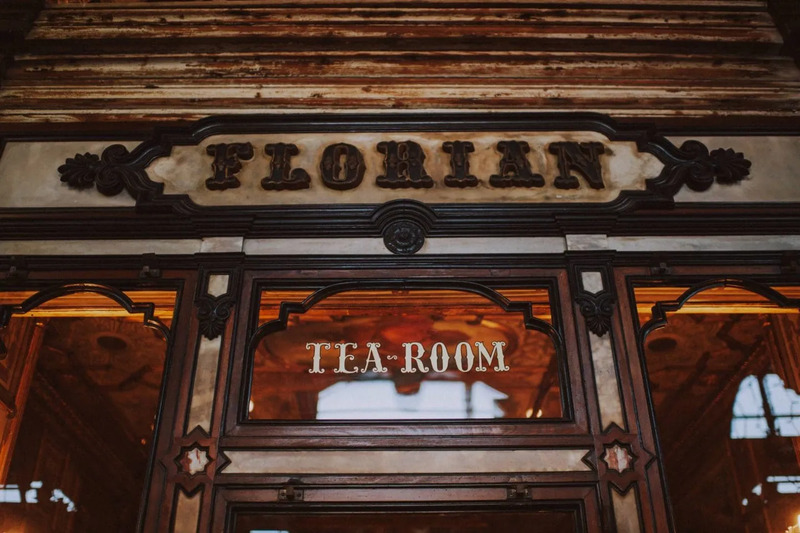 It must be remembered that Caffe Florian has always been the favourite place for the gathering of famous personalities. 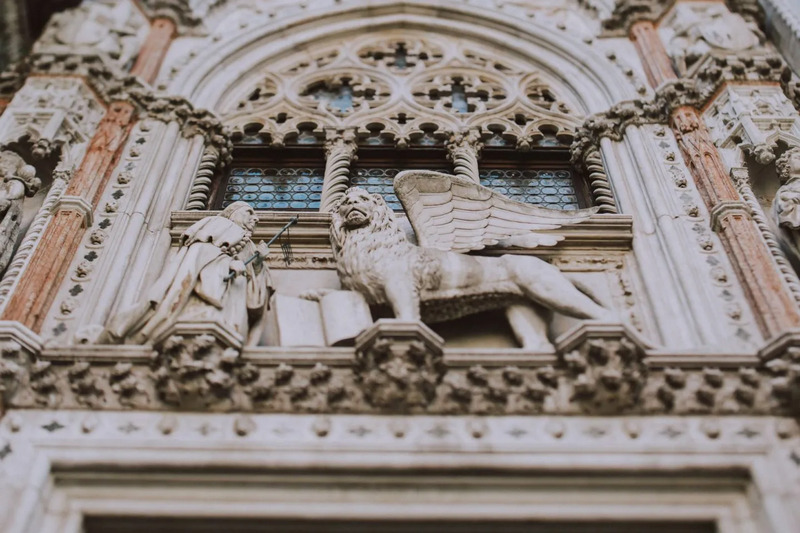 Persons such as Charles Dickens, Hemingway, Lord Byron. 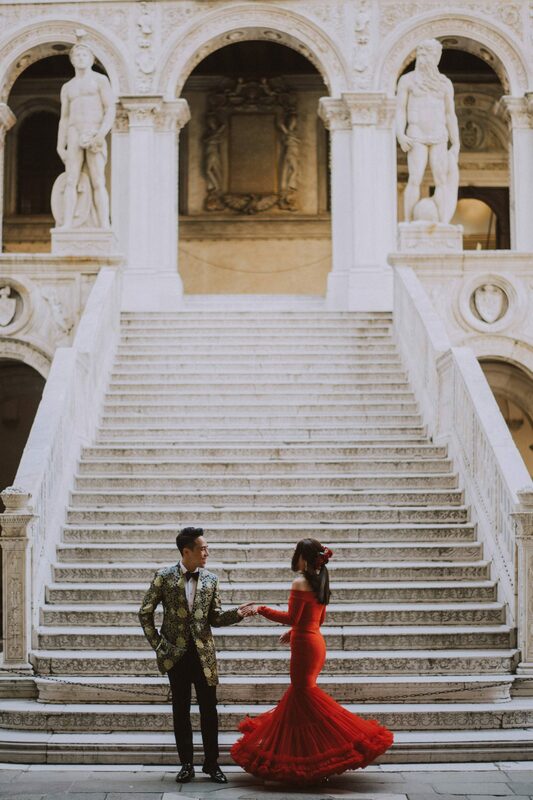 Even Casanova! 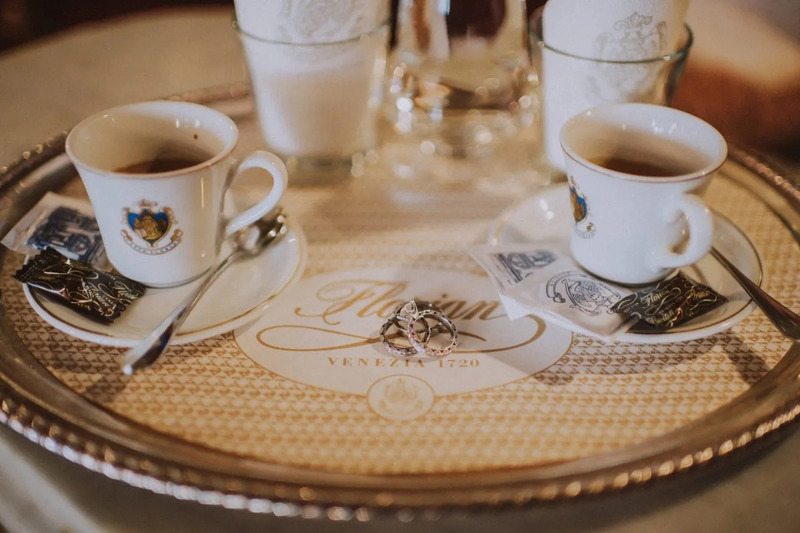 These are just a few of the names that have took a sip of coffee in here. 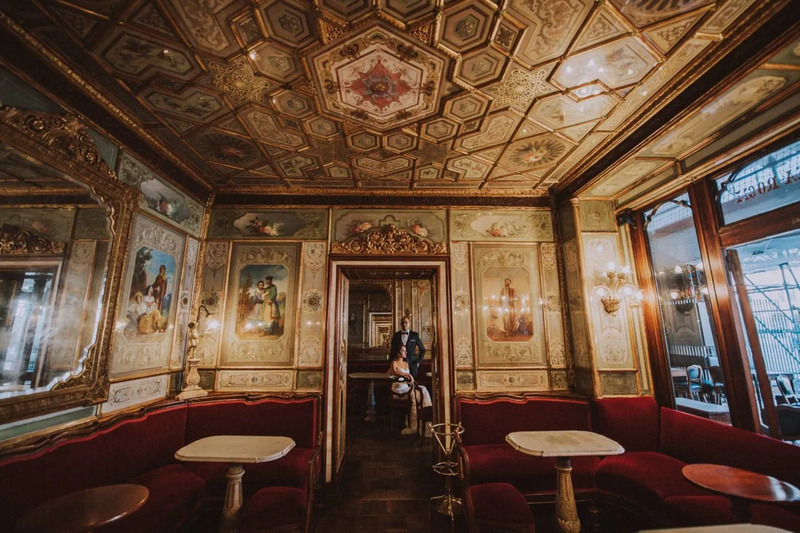 What makes this caffe so special and stunning is not only its frescoes walls and ceilings but also the mirrors. 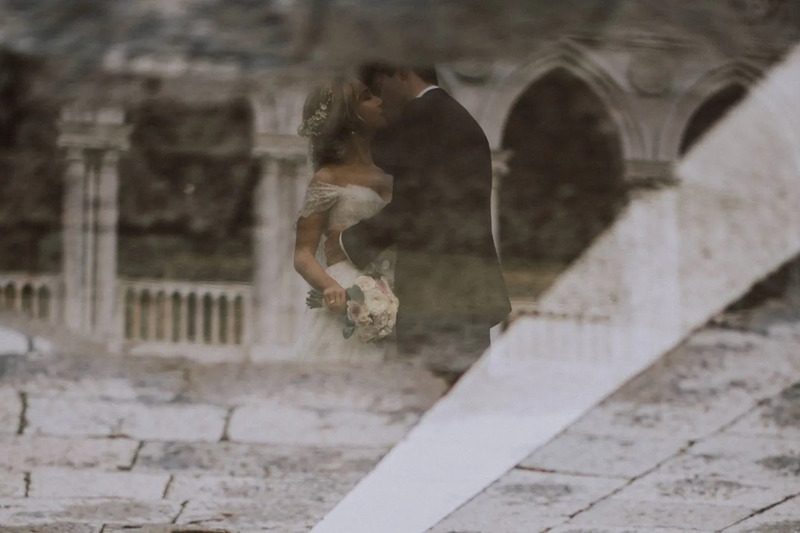 Giant mirrors with gilded frames patinated by age. 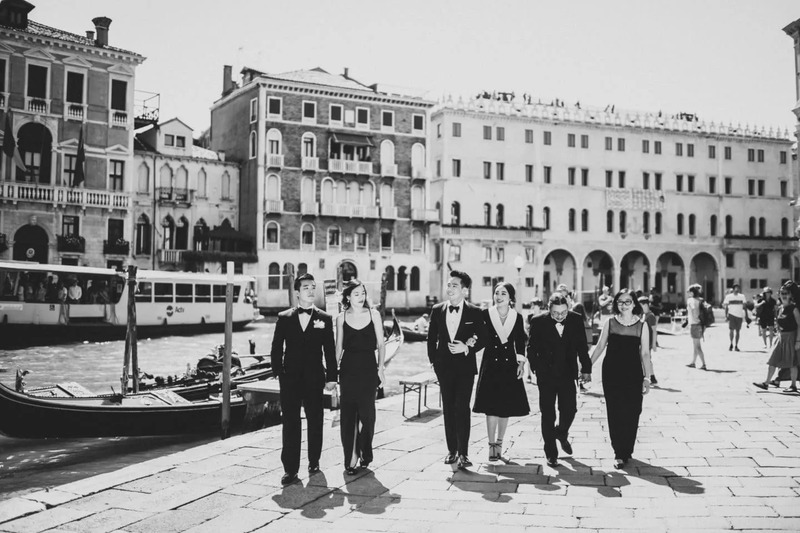 Now just image having on your living room’s wall a photo framed. 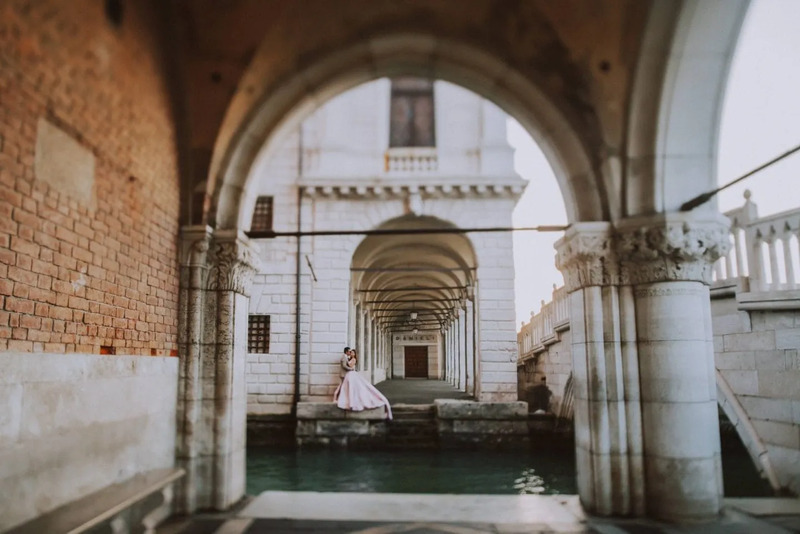 One of the many photos taken during your honeymoon in Venice, wearing your wedding dress. 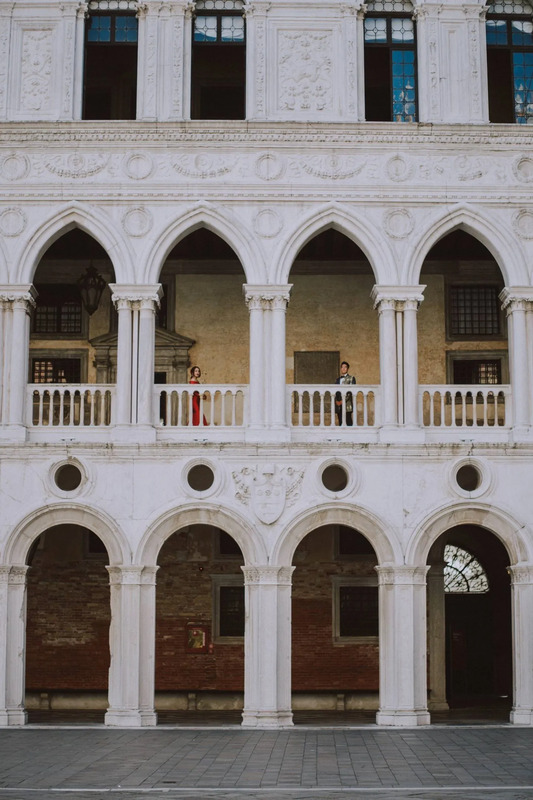 This truly feels like to be in an exquisite carillon with the sound of Vivaldi’ Spring in the background. 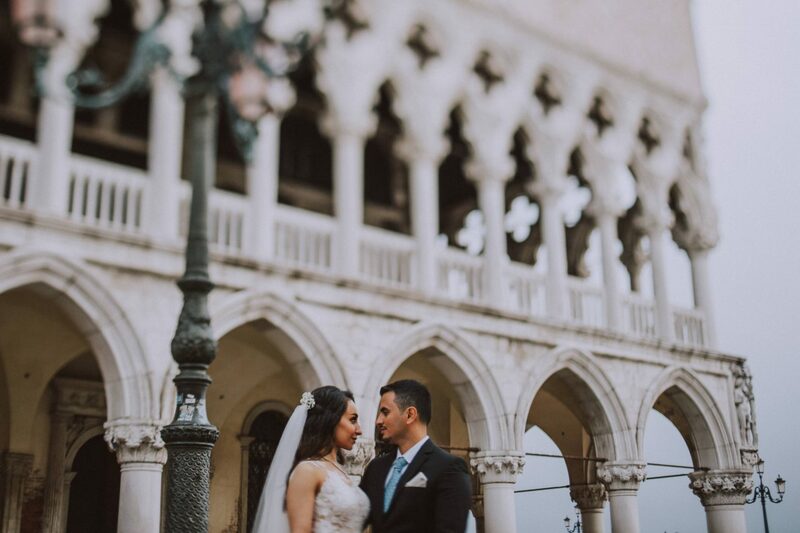 Peering through the beautiful windows you can immediately see the magnificence inside and all of a sudden, you are immediately transported back in time! 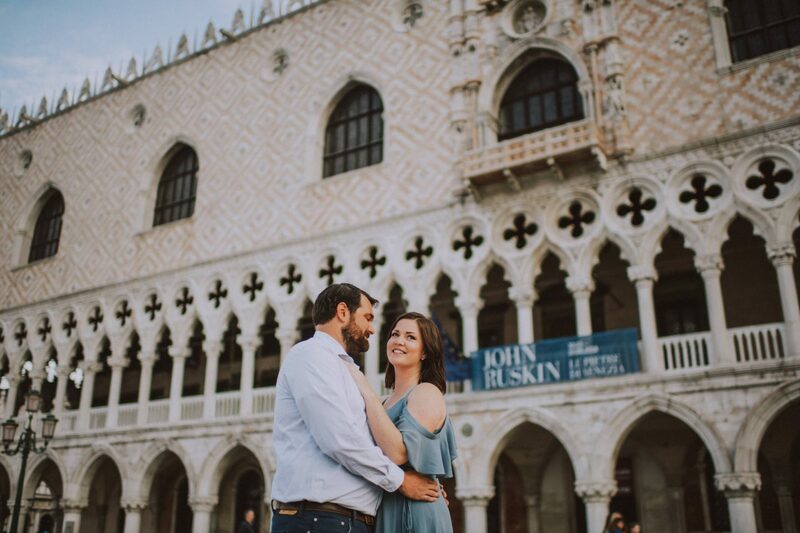 If you really want to have the very best memory from Venice, include this spot in your photo itinerary! 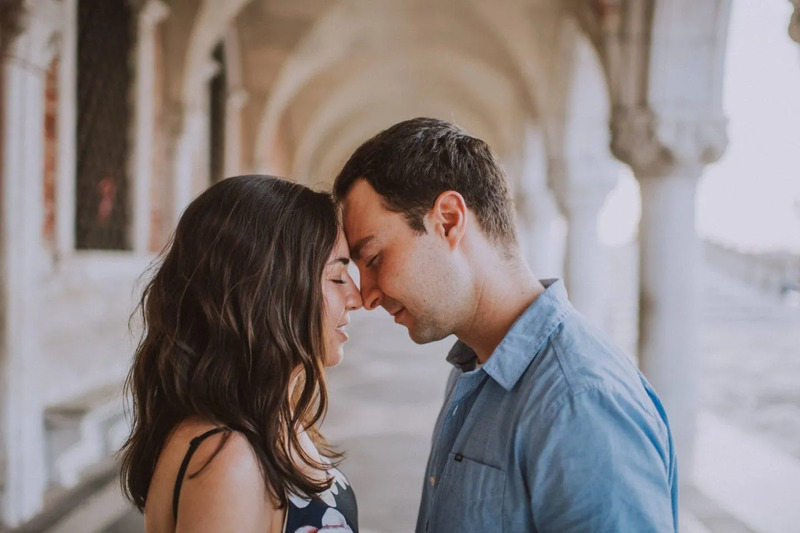 It is absolutely worth it! 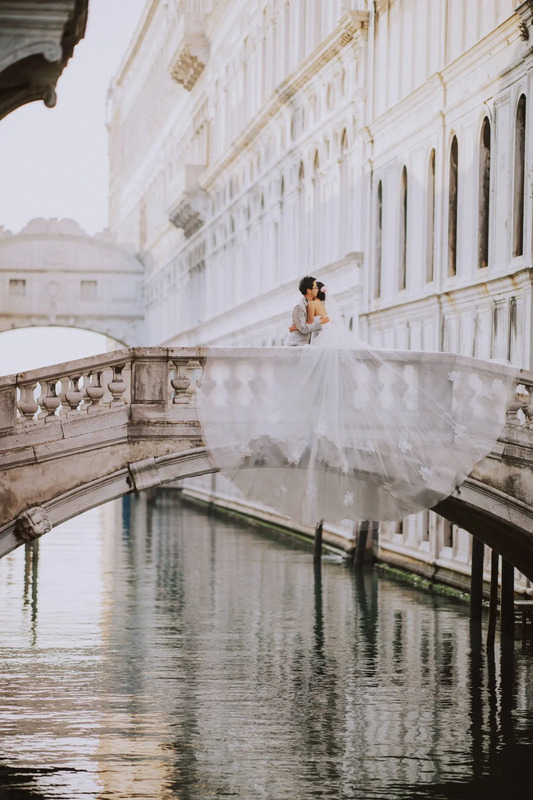 What could be more beautiful than a romantic photo of you two kissing with the Bridge of Sighs behind you? 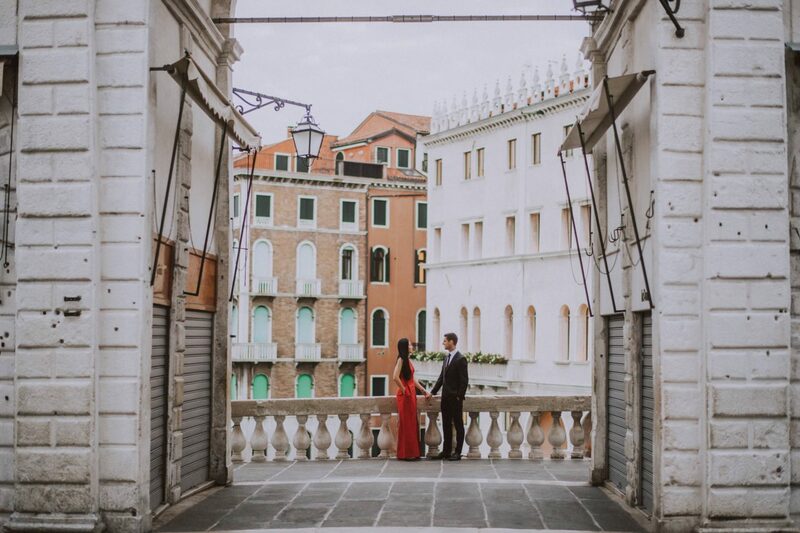 This famous bridge assumes particular importance during a romantic gondola ride. 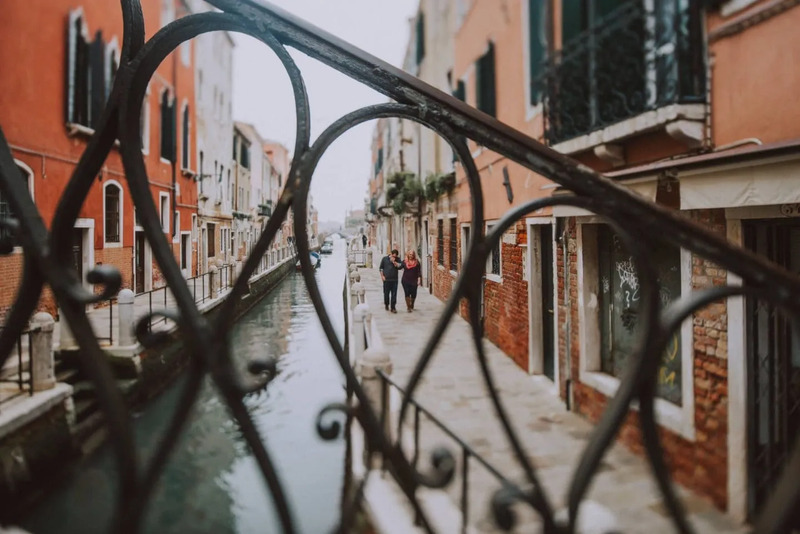 In fact, it is believed that if you kiss on a gondola when passing underneath the Bridge of Sighs, you will enjoy eternal love. 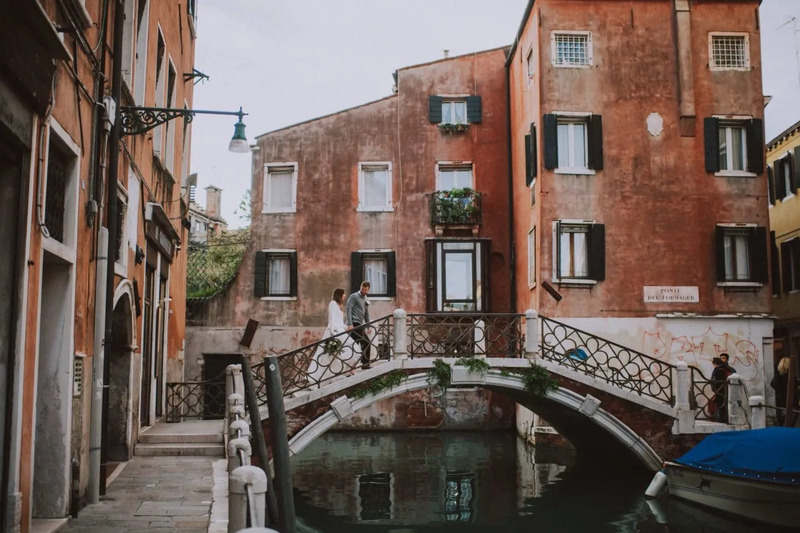 It connects the south side of the Piazza to the waterway of the lagoon. 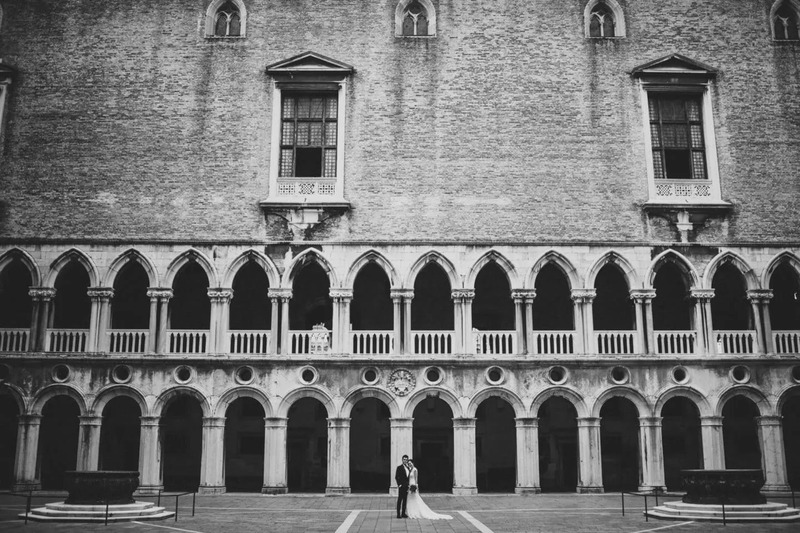 In fact, it lies between the Doge’s Palace and the Biblioteca Marciana on the west. 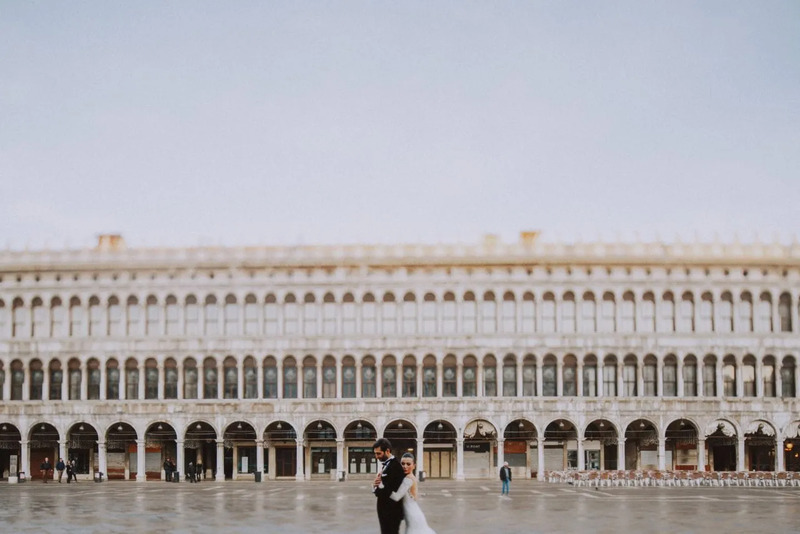 This is where I photograph my couples among the Gothic arcades of Doge’s Palace. 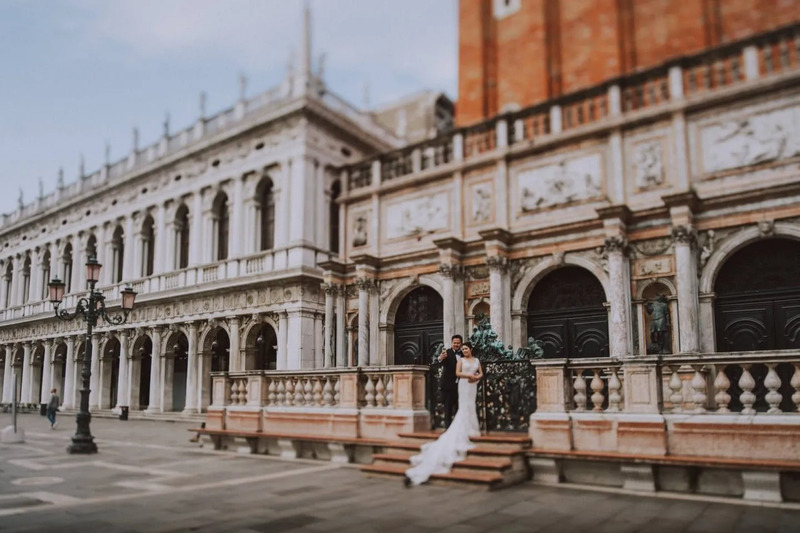 Built in Venetian Gothic style, it was the residence of the Doge of Venice. 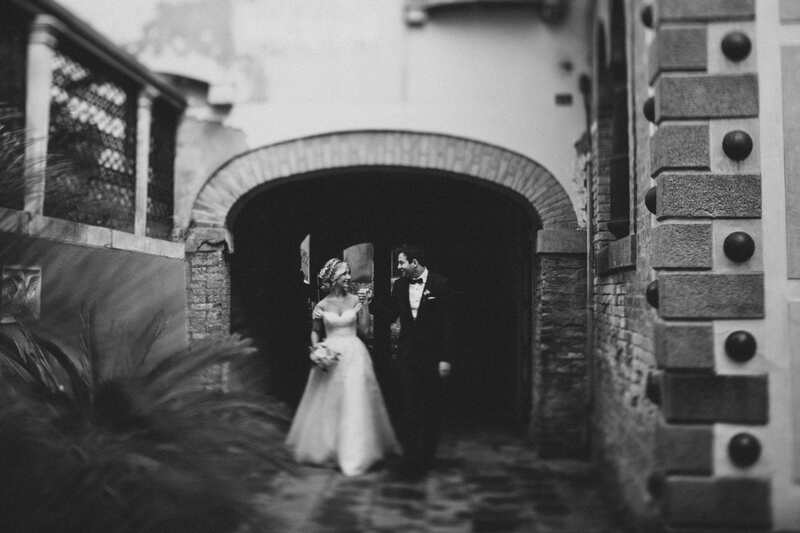 As mentioned before, it is very popular to take photos under its arcades. 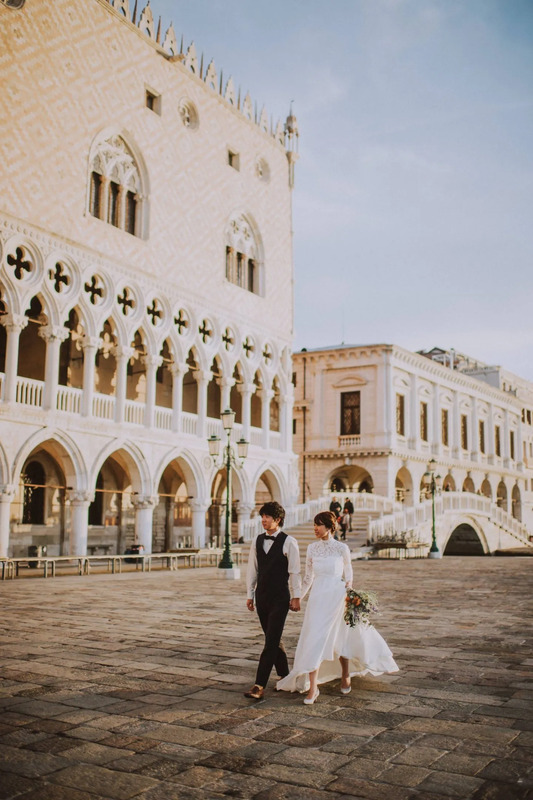 Before starting the photoshoot inside, I absolutely don’t miss to guide my couple in front of Porta della Carta. 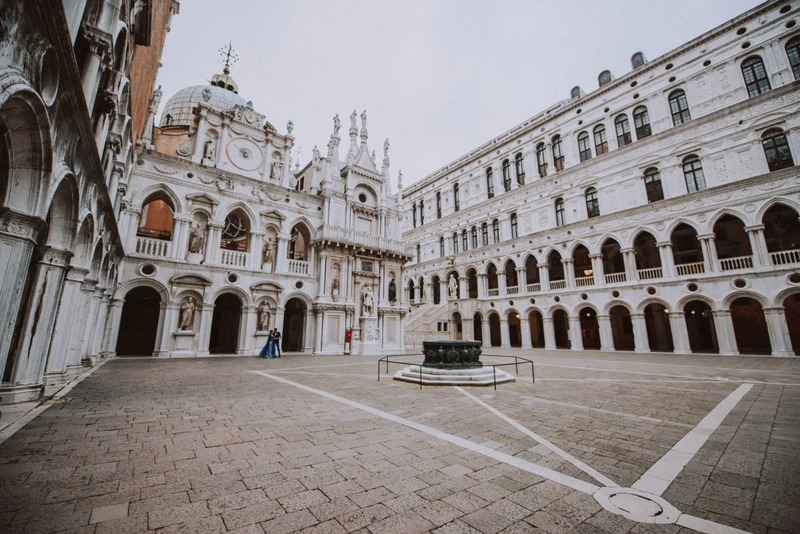 The north side of the courtyard is closed by the junction between the palace and St. Mark’s Basilica. 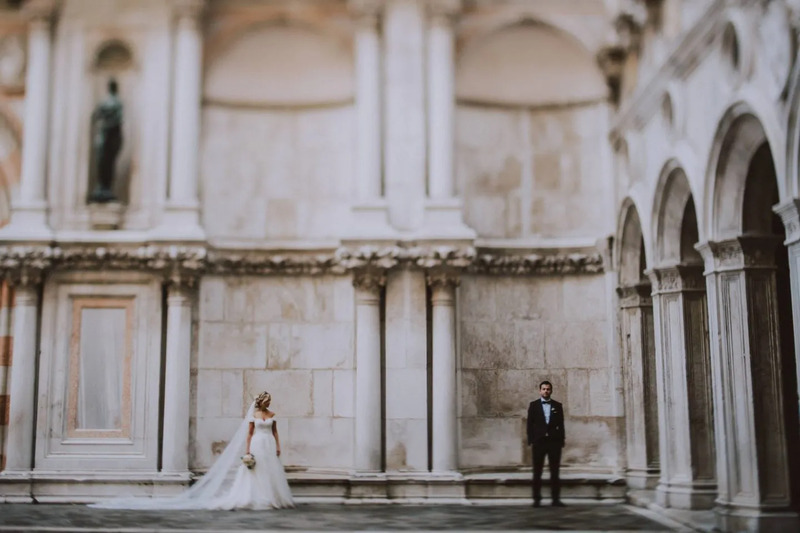 Did you know that originally it used to be the Doge’s chapel? 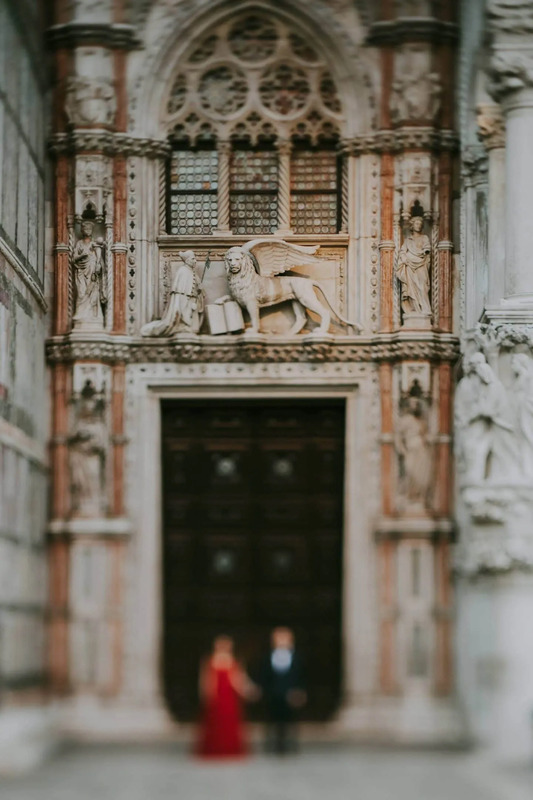 Since 1567, the Giants’ Staircase is guarded by Sansovino’s two colossal statues of Mars and Neptune. 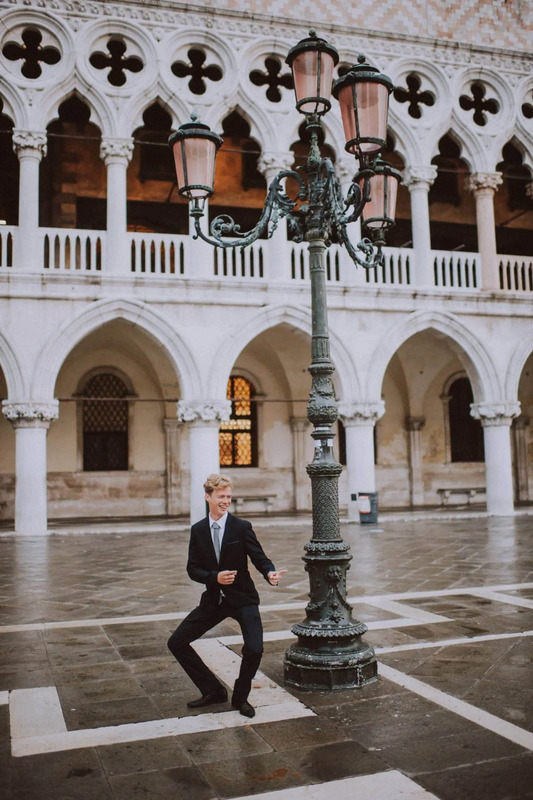 Statues which represents Venice’s power by land and by sea, and therefore the reason for its name. 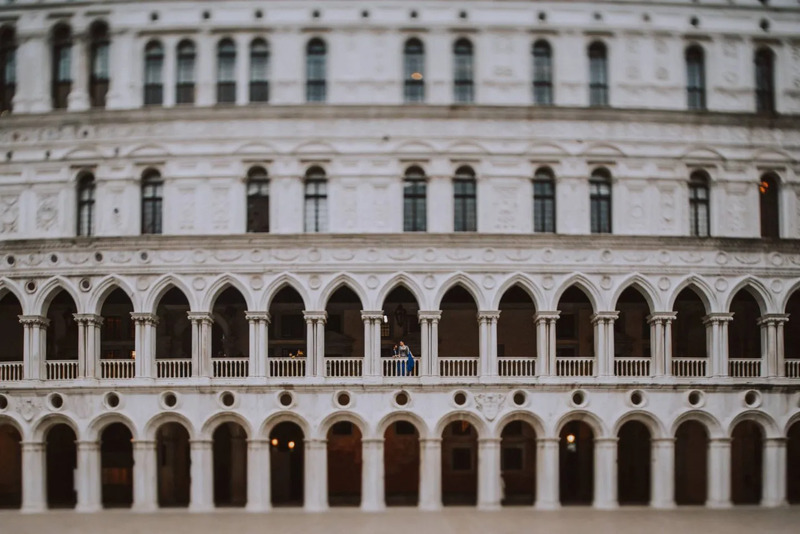 Members of the Senate gathered before government meetings in the Senator’s Courtyard, to the right of the Giants’ Staircase. 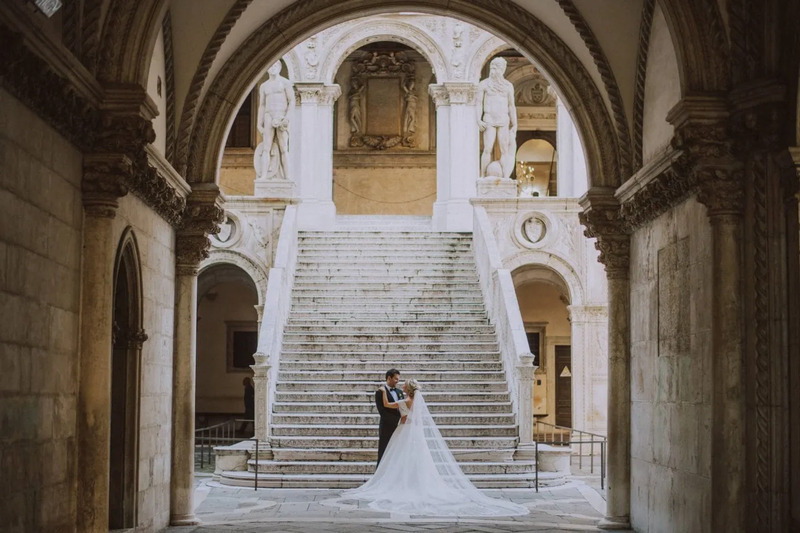 It is such a stunning and magnificent location! 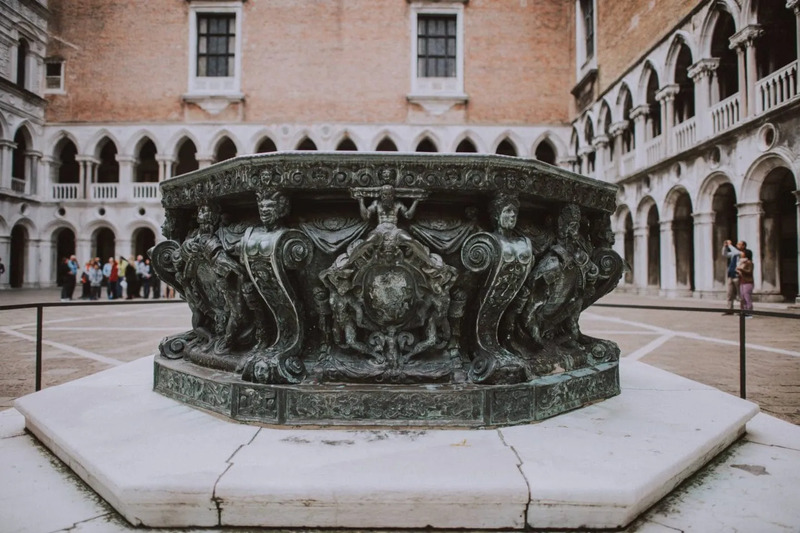 At the center of the courtyard stand two well-heads dating from the mid-16th century. 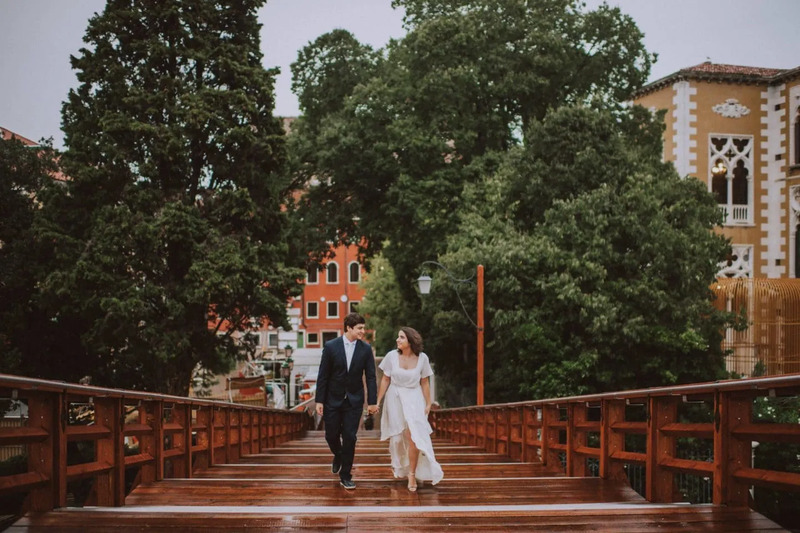 This wooden bridge is one of the four bridges to span the Grand Canal in Venice. 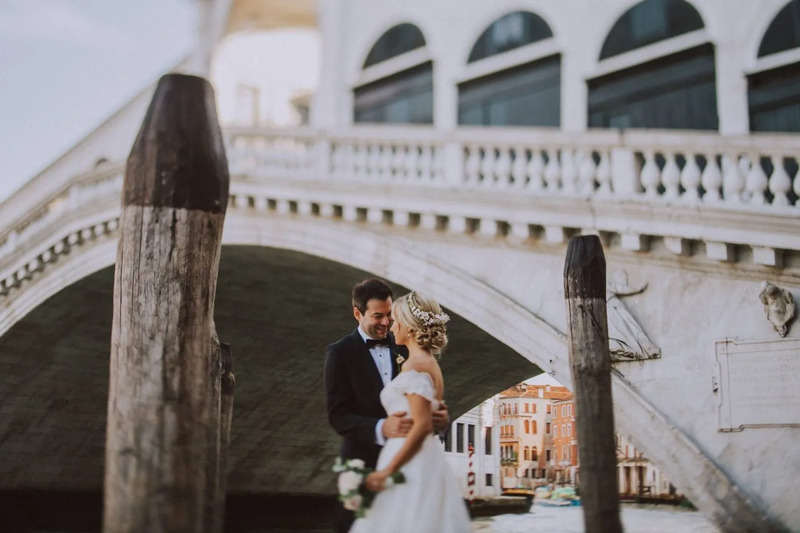 The view from Rialto Bridge is beautiful, but the one seen from Accademia bridge is simply breathtaking! 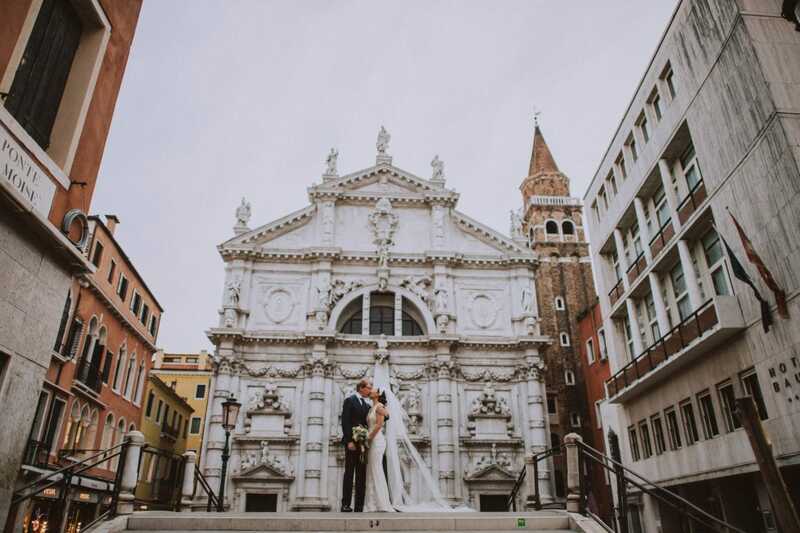 In fact, from here you can enjoy the beauty of Santa Maria della Salute church. 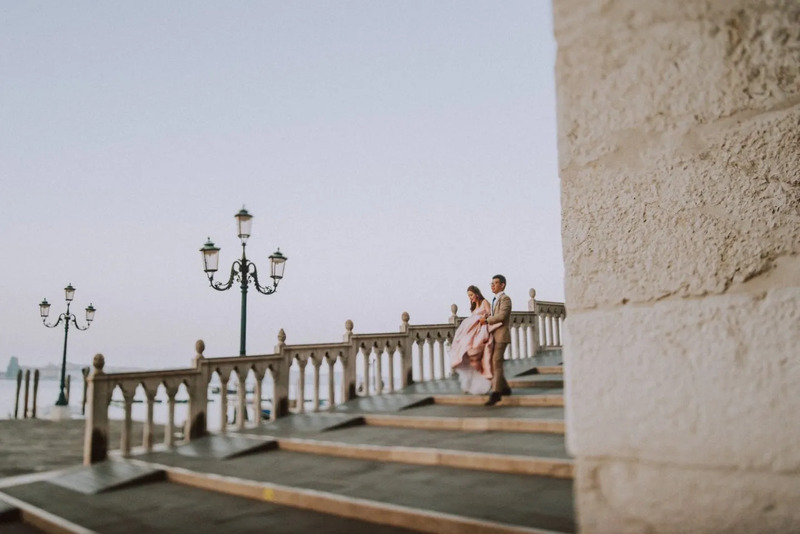 There is a beautiful location where it is possible to enjoy a full panorama. 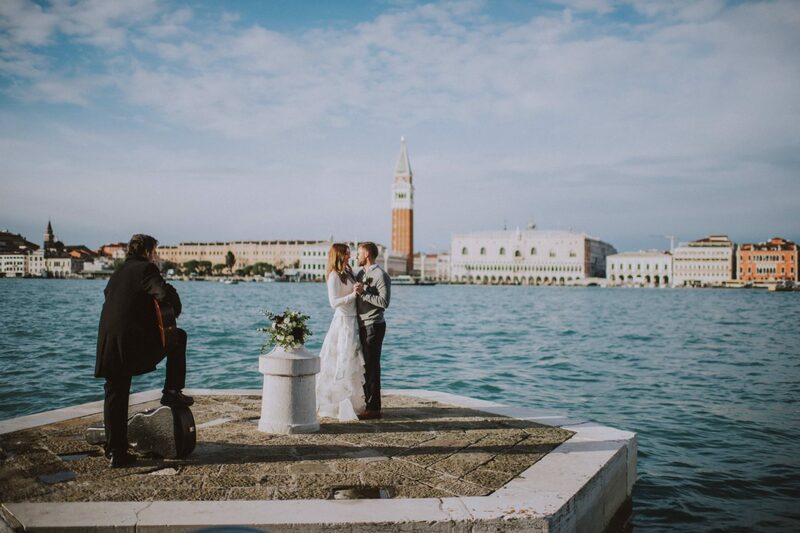 Not only the Grand Canal and St Mark’s bell tower but also San Giorgio island as well as Giudecca island. 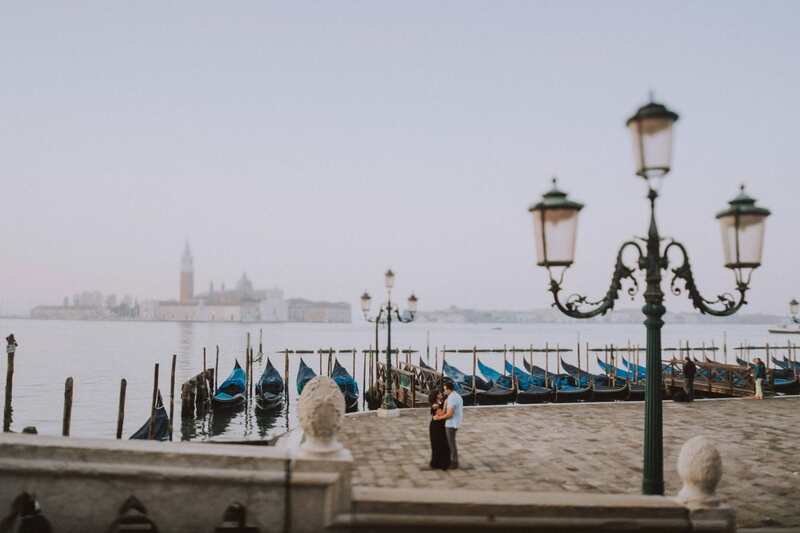 What a rich view! 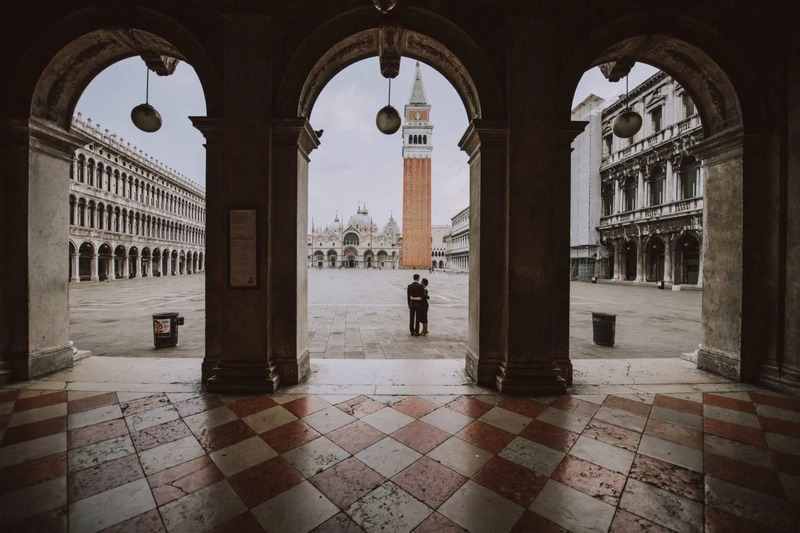 For a matter of time, I don’t include commonly this spot in my photo tour. 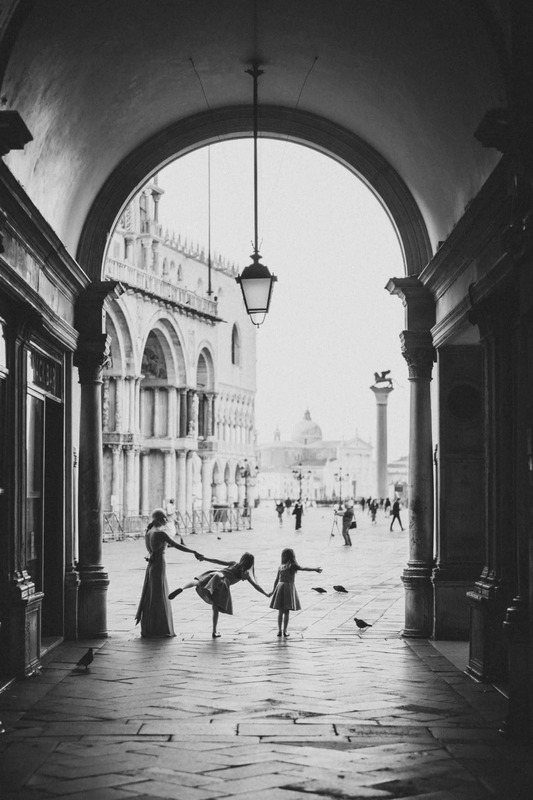 Firstly because of the time limit. 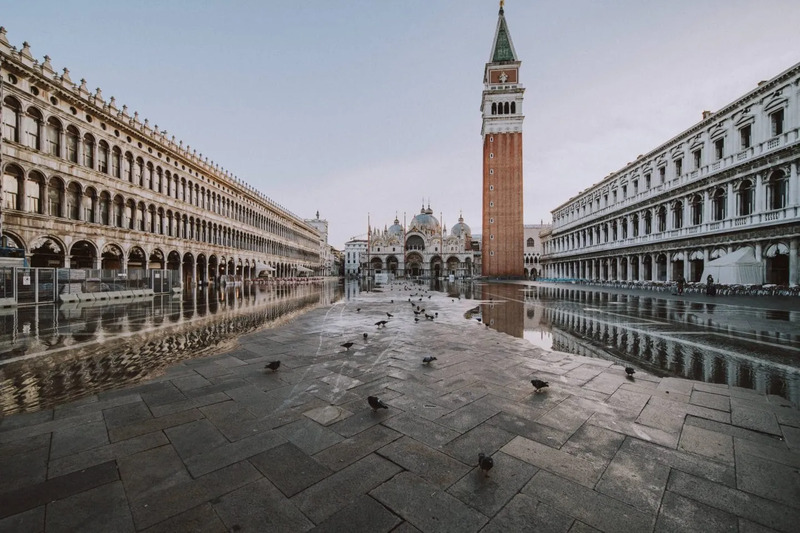 For example, in an hour of shooting starting from St Mark and its surrounding area there is no time to reach this location. 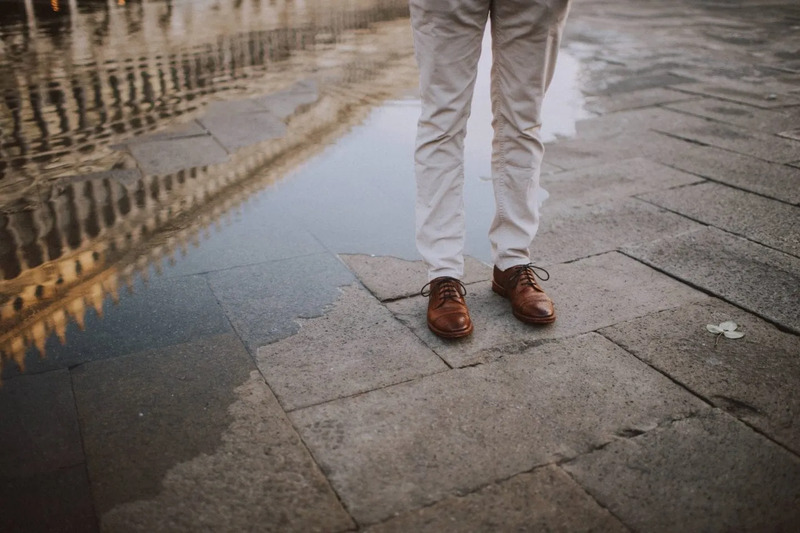 In fact, we would spend half an hour minimum just walking. 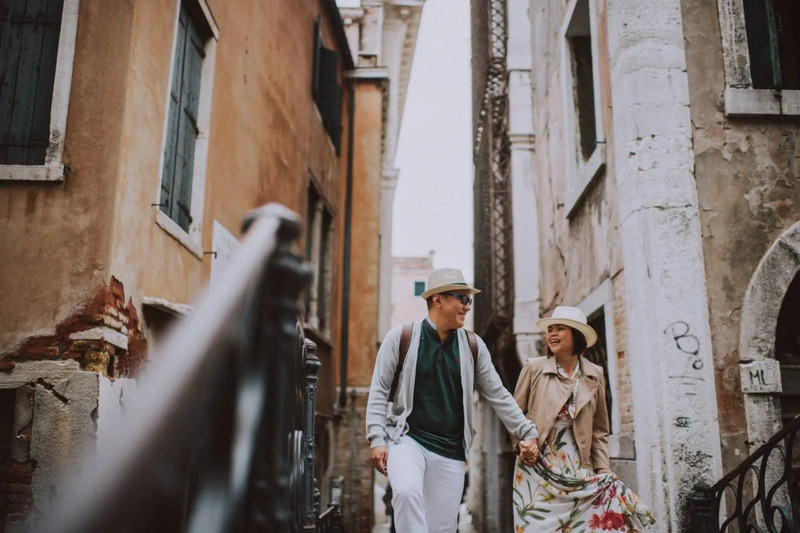 In any case, every tour can be customized according to your wishes! 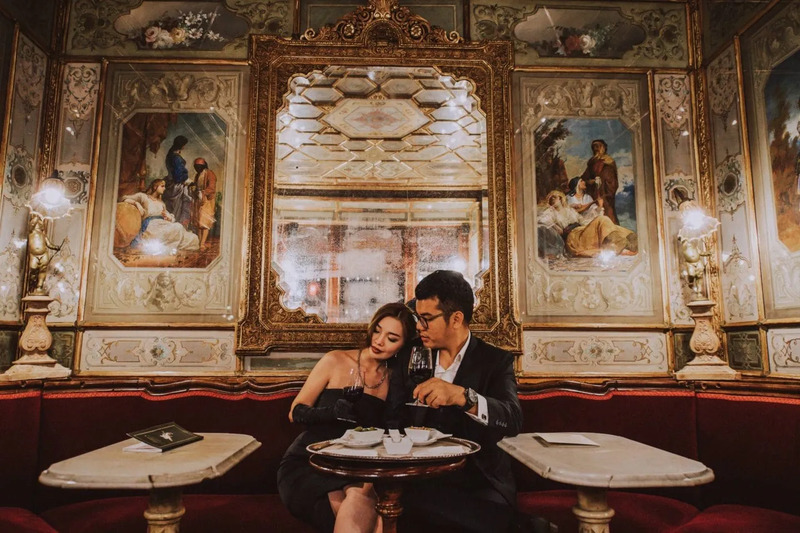 Just tell me which locations you would like to include and I will be able to tell you the approximate time we would need or, to put it another way, it would be recommended to spend. 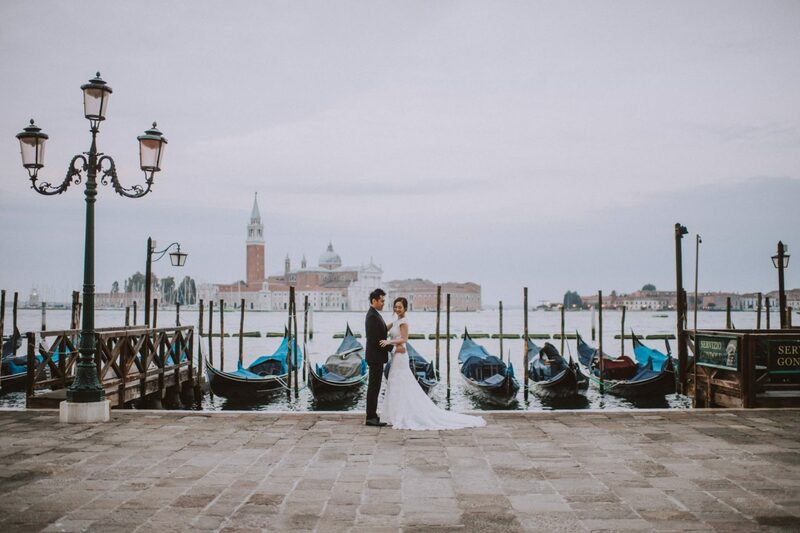 Venice is St Mark, Rialto Bridge, Doge’s Palace, Accademia Bridge, Punta della Dogana or Santa Maria della Salute. 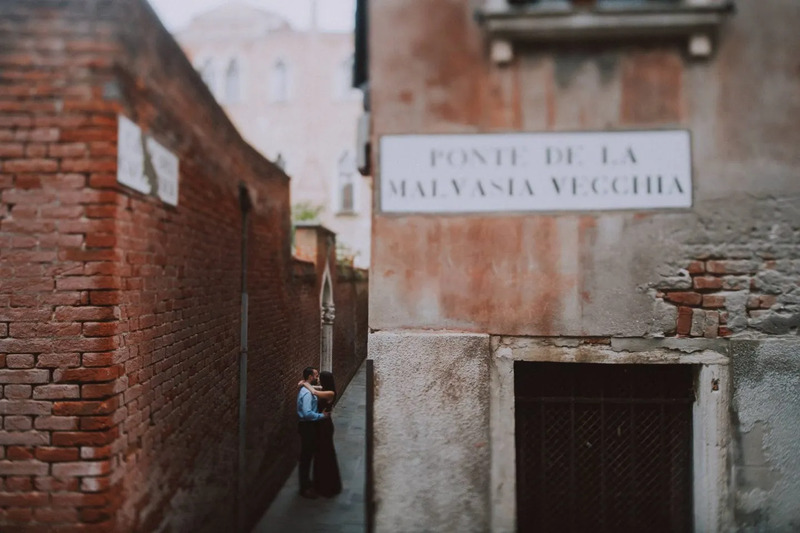 But most importantly, Venice is also those romantic narrow alleys where you can withdraw with your lover. 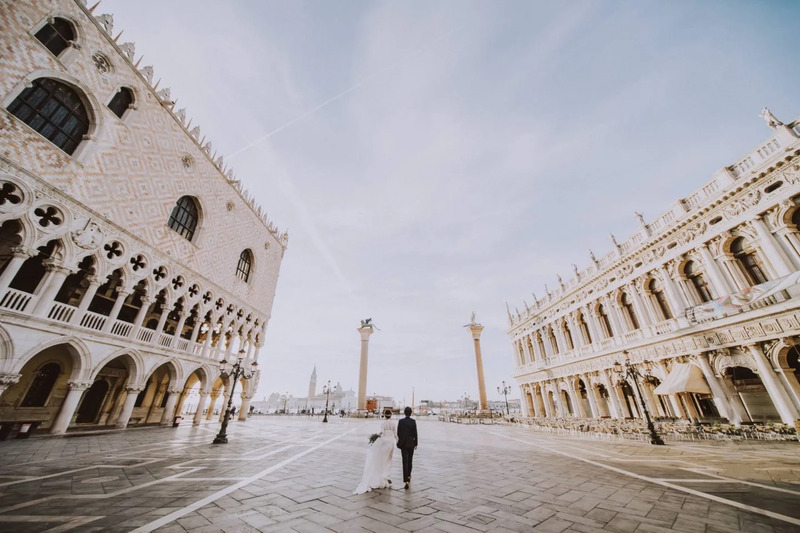 Far from prying eyes you will be able to live the Venetian experience on a higher lever! 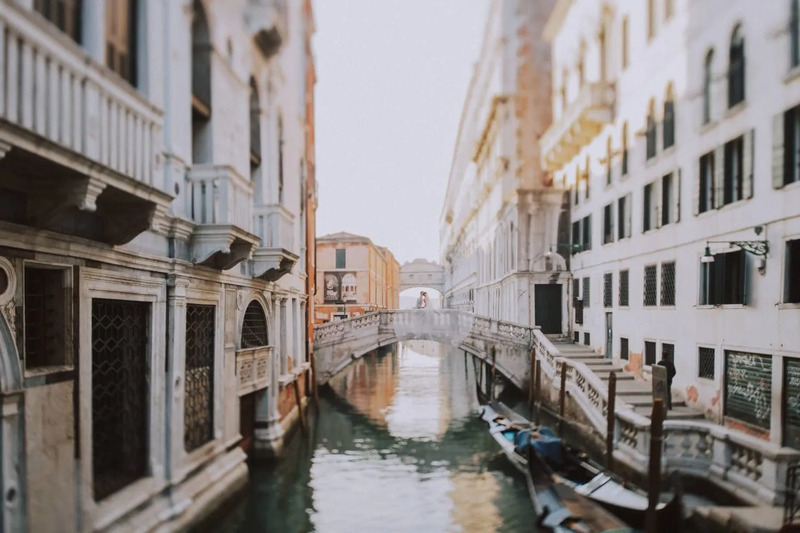 Did you know that it was originally made of timber? 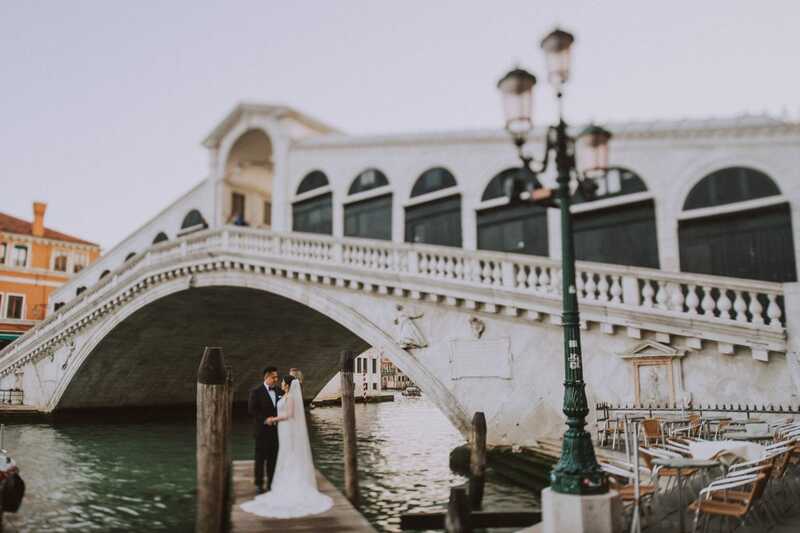 Rialto Bridge was built of stone in 1591. 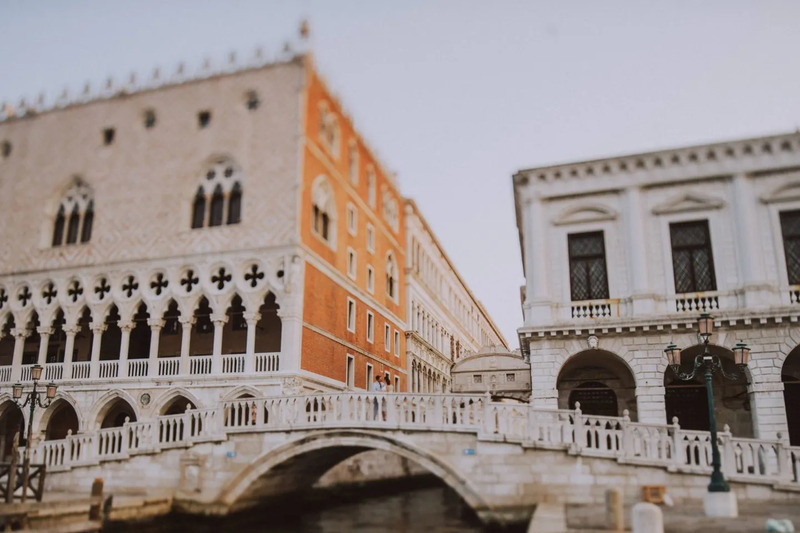 It must be remembered that the original structure was built in 1255 and had survived being burnt during a revolt and a collapse under the weight of a crowd on it. 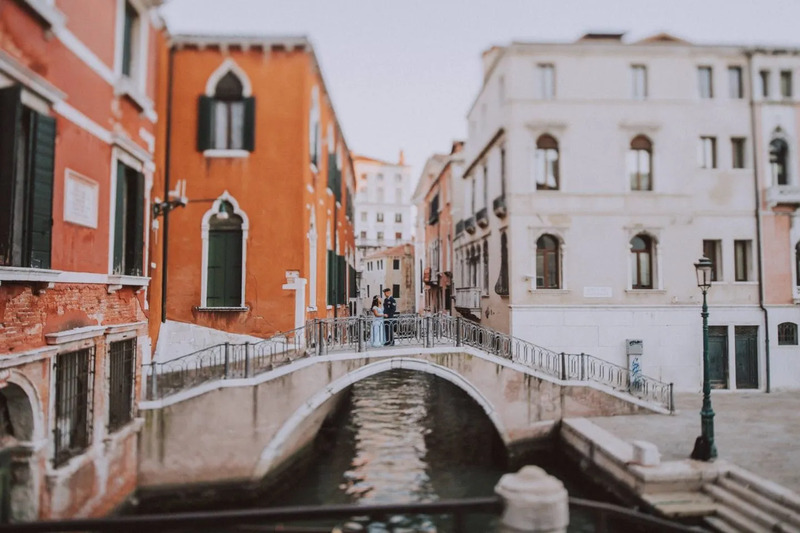 Rialto Bridge is the oldest bridge in Venice. 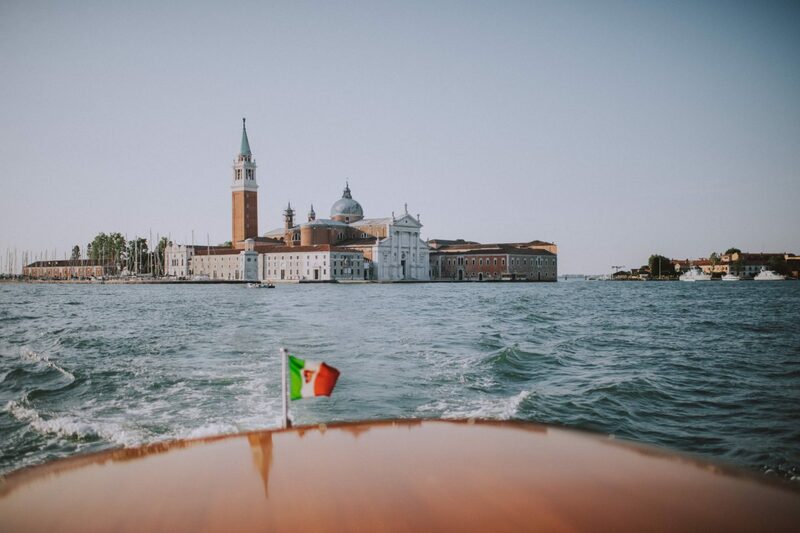 The view of San Giorgio Maggiore island is one that every visitor of Venice recognizes. 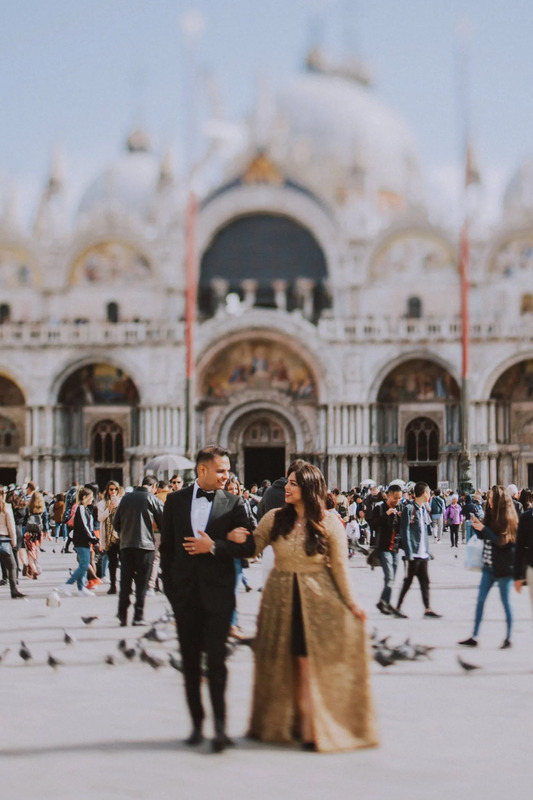 Moreover, it is probably amongst the most photographed sites in the city. 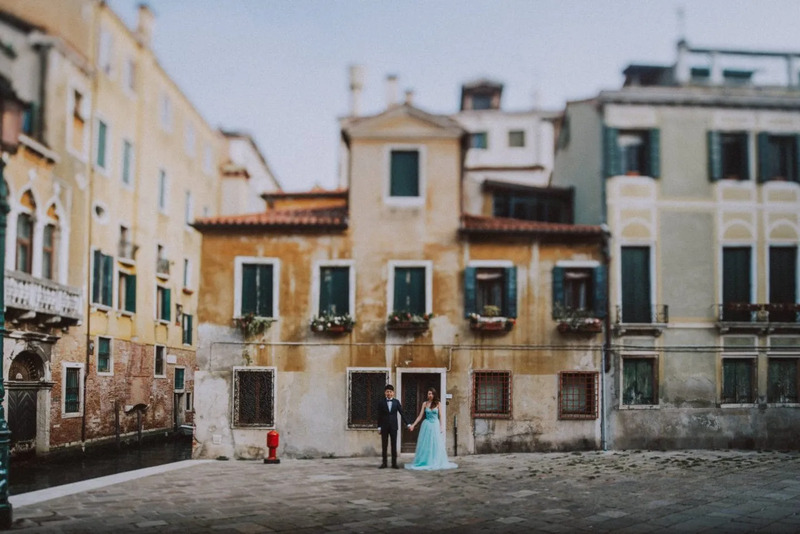 Especially for wedding photo sessions.